So we are off. 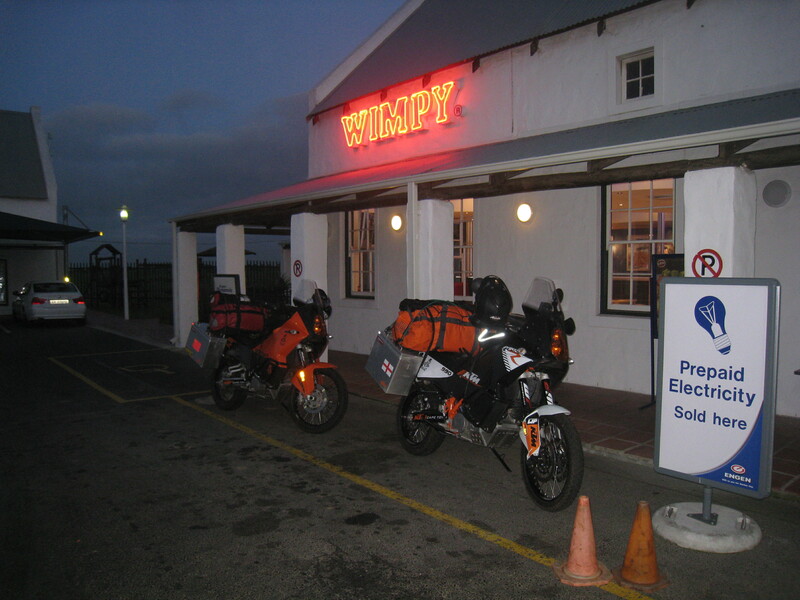 It’s an early start as we head north on the N7, stopping just outside the Cape Town suburbs for fuel, a quick check of the bikes to ensure that everything that should be attached actually is – and a petrol station Wimpy fry-up breakfast with the truckers. It took a while for the sun to come up, but it was still very cold until we passed the mountains where I used to paraglide two decades ago around the Porteville area. 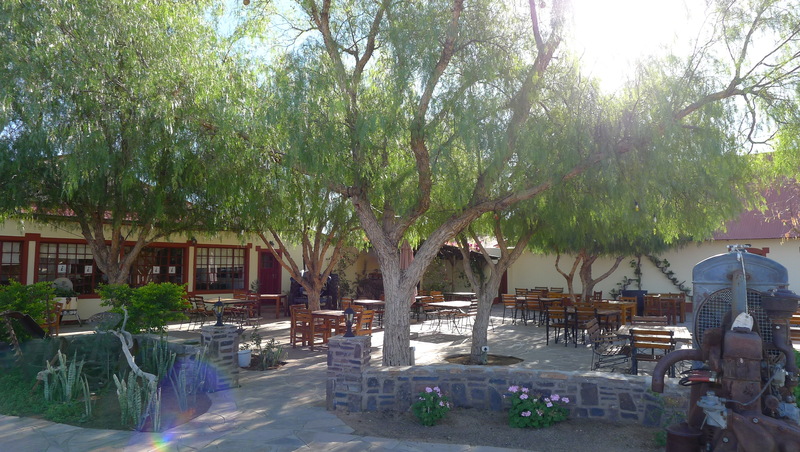 We rode across the vast valley full of wheat fields and up over the pass into Citrusdel, an town surrounded by fruit orchards and where I once landed in an “All Africa Paragliding competition” almost 15 years ago. It seemed a long time ago but the scenery remained the same. It was definitely faster on a motorbike. 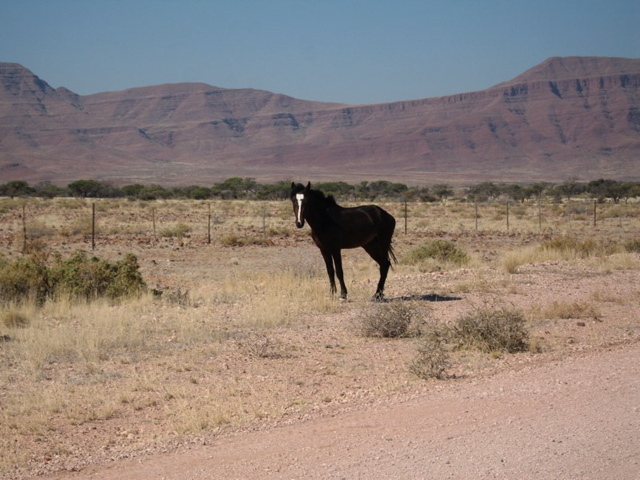 As we headed north the scenery changed quickly from green Cape vineyards and mountains to the brown and yellow of the Cederberg and Karoo. 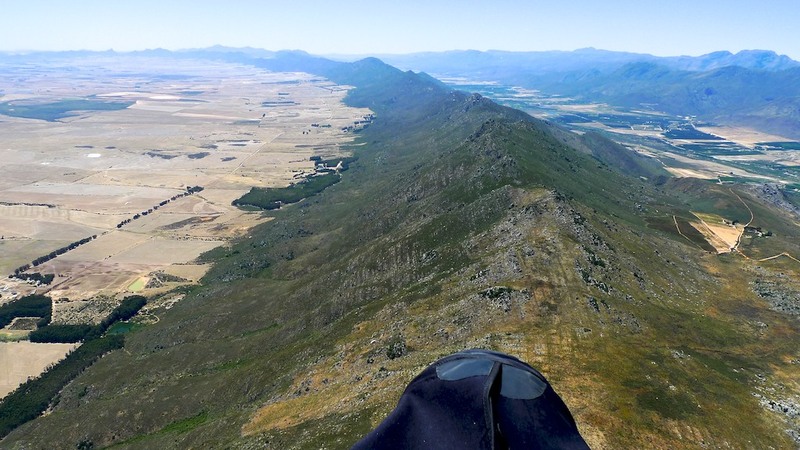 Porteville from a paraglider’s perspéctive… the N7 is to the left of this picture and then crosses over a ridge pass and down the other side towards Citrusdel at the top right. From there on it is due north all the way to Namibia. 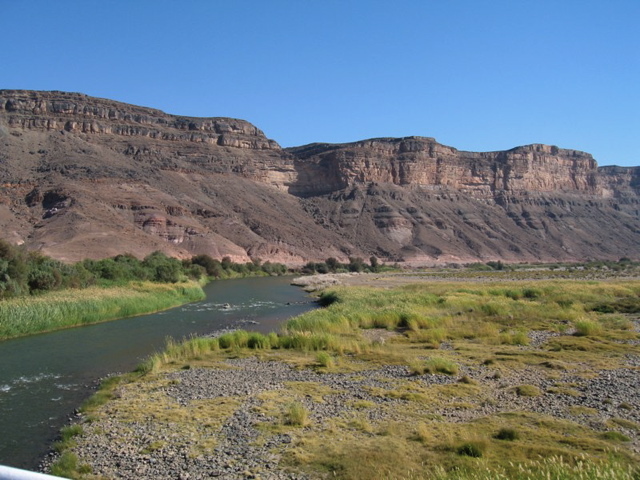 On the banks of the Orange River…. 18 months later we will camp on the banks of the Yellow River on the other side of the world. 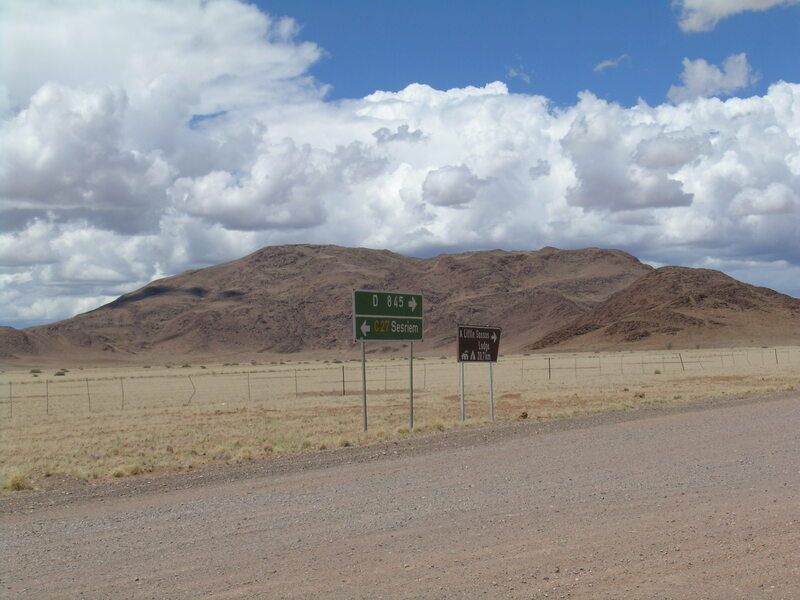 We made good progress to the northern South African town of Springbok, but did not stop and carried on up to Vioolsdif at the border with Namibia where the scenery had become very much dry reddish brown desert and rocky mountains. 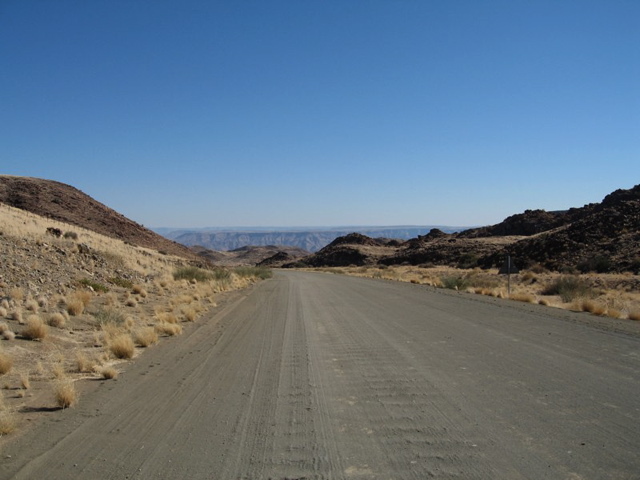 Just before the border crossing we turned off the main road and headed west along the banks of the Orange River to a camp site which was pretty much deserted. We pitched our tent in the same location my friend, Nick Dobson and I camped at two years previously on another motorcycle trip. At that time it was the Southern Hemisphere summer, baking hot and the air thick with insects. In order to keep cool we wallowed in the river and illegally swam over and entered Namibia a few times with an unusually lean Labrador dog. This time it was quite cold, definitely no swimming as the water was quite high and there was a rumour of cholera reaching this far down river. It was very quiet and there was no food to be had in the camp site, except a couple of beers which we drank whilst exploring the banks of the river and wandering through pumpkin fields with various dogs that decided to adopt us, including the yellow Labrador that befriended me the last time I was here. 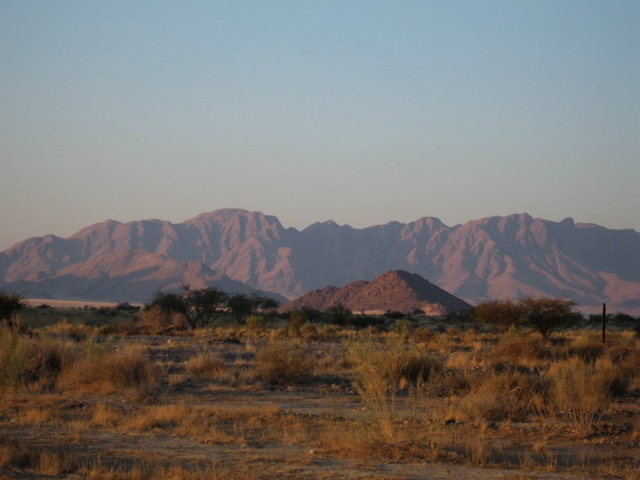 Surrounding the thin green ribbon that surrounds each side of the Orange River were very arid and red looking mountains that stretched as far as the eye could see. 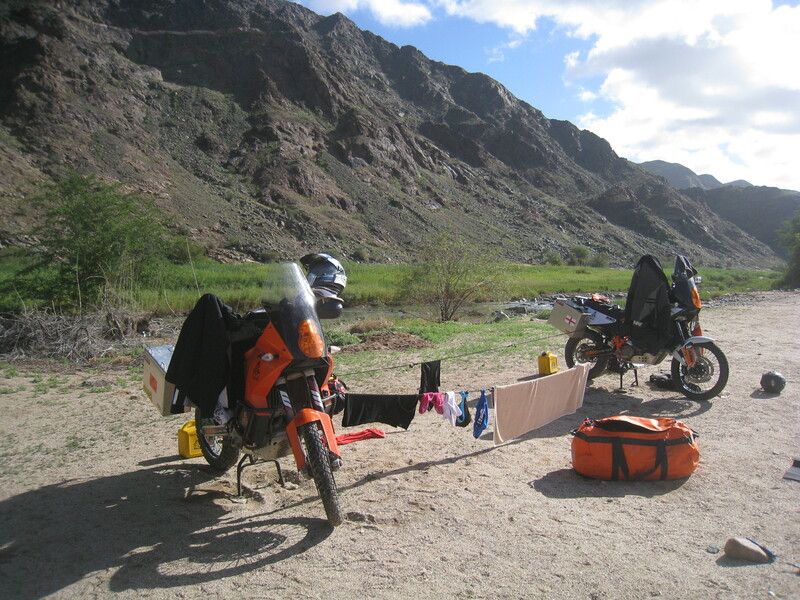 As we settled in for our first camp after more than 700 kilometers of riding from Cape Town I could not help but think that we had far too much kit and it took an age to unpack it, sort it out and of course re-pack it the next day. The Vaude Mk II Light tent we got from China was excellent and was to prove throughout the expedition a very sound investment indeed. It was to be our home for many months and protect us not only from the rain, sun and sand storms, but also keep out any critters that came sniffing around in the night, such as leopards that paid us a visit on at least a couple of occasions, but most importantly insects and the dreaded mosquito. 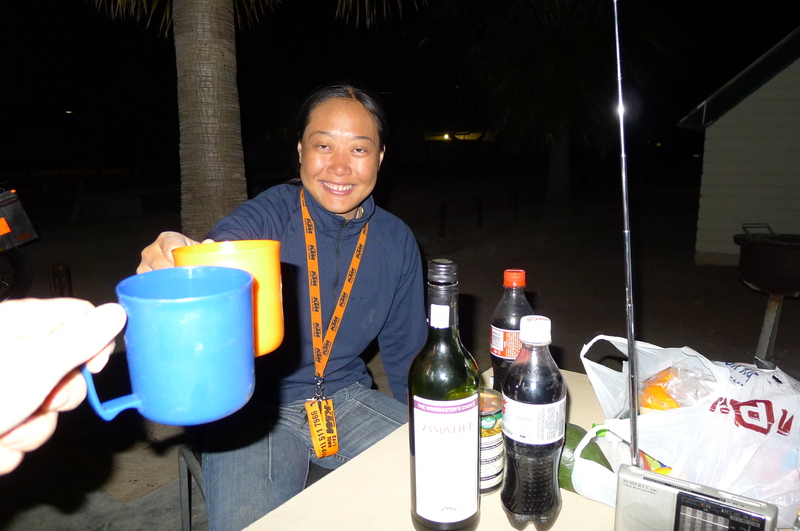 Camping, of course, was all new to Fanny and she was not sure what to do, but after a few days it soon become a fine tuned procedure with each of us doing our setting up and getting packed tasks in perfect sync. 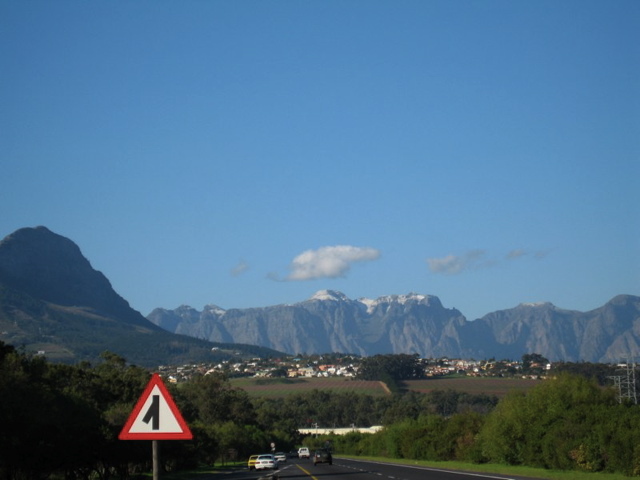 I had a change of mind in Cape Town as we were preparing our equipment, and despite the added expense, I had replaced our 2.5 cm standard sleeping mats with 7.5 cm ones – a very wise decision as it turned out as sleeping on these thick mats was like sleeping on a proper bed. These South African mats (Thermal Comfort 7.5) also had velcro down each side so that they could be joined together to make a pretty decent double bed inside the tent. A thin mat is perfectly OK for hiking and short adventures, especially if you have to lug it around in a rucksack, but when your adventure is going to last months, or perhaps years as ours did, getting a comfortable and decent nights kip is vitally important. 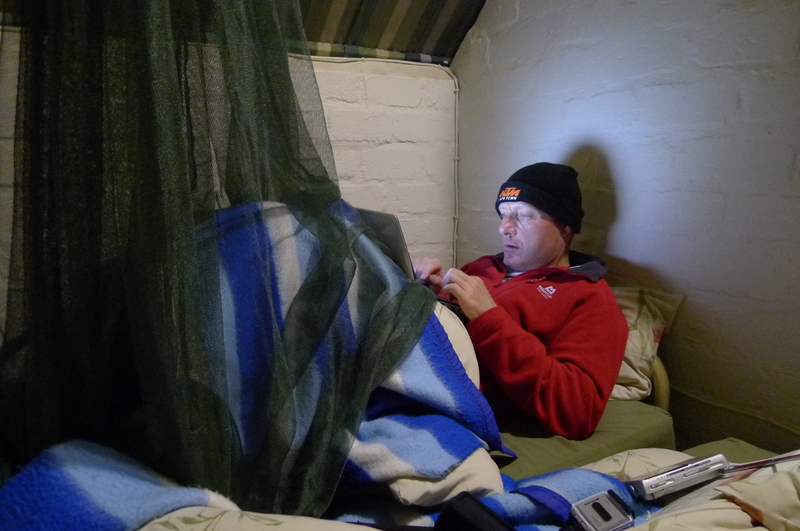 Here in northern South Africa and Namibia at this time of year (June/July) the temperature plummets during the night, often to below freezing and so the heat insulation from a good sleeping mat was also very important. We would later camp in the more chillier climes of the Alps, Pyrenees, Dolomites, Himalayas and, lets not forget, England and Wales! Deciding what to carry (or not) is always a judgment call between keeping all the equipment on our bikes as light as possible, and the benefit that particular piece of equipment actually brings. 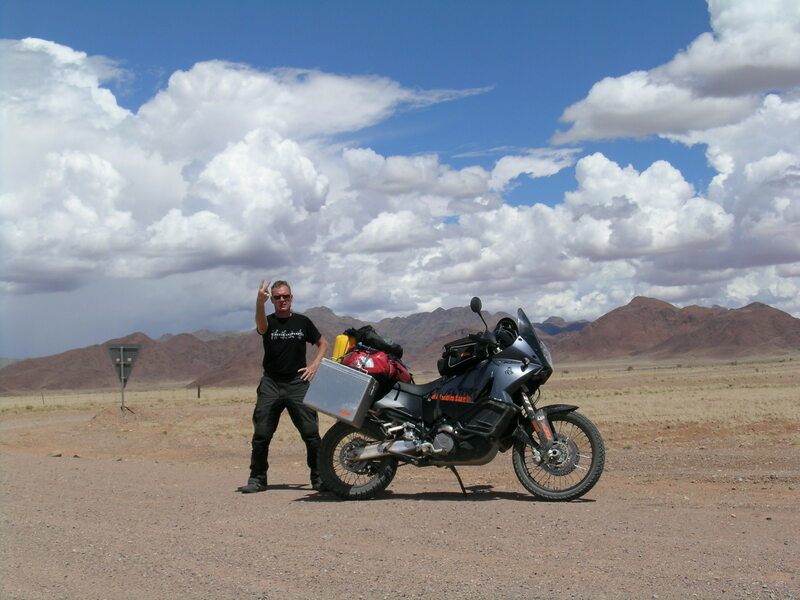 Often when planning an expedition adventure bikers will bring too much and its only when you start riding your large and heavy adventure bike on sand or “off road” that you start to reassess whether you actually need all the things you brought along. These sleeping mats were not exactly light, perhaps a couple of kilos, and they were quite bulky, rolling up into a 1.2 meter long by 35 centimeter diameter tube. However, they actually fitted very nicely strapped down against our North Face bags across the rear seat and metal panniers. 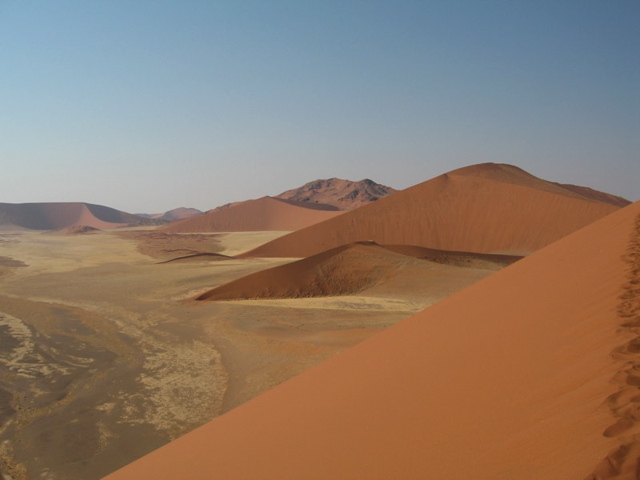 Our sleeping bags were actually quite cheap ones and not that warm and at about 3-4 am each morning in the Namib desert, for instance, we would both wake up cold and try our best to ensure all the warm air was sealed inside and that there were no gaps for cold air to creep in. Its always coldest just before dawn because the ground and air has had longer to cool. Wisely, we bought small and light hi-tech sleeping bag liners which not only allowed us to keep our sleeping bags relatively clean inside, but added 15 degrees of warmth as the desert temperatures plummeted. They could also be used as light sleeping bags on their own in warmer conditions. 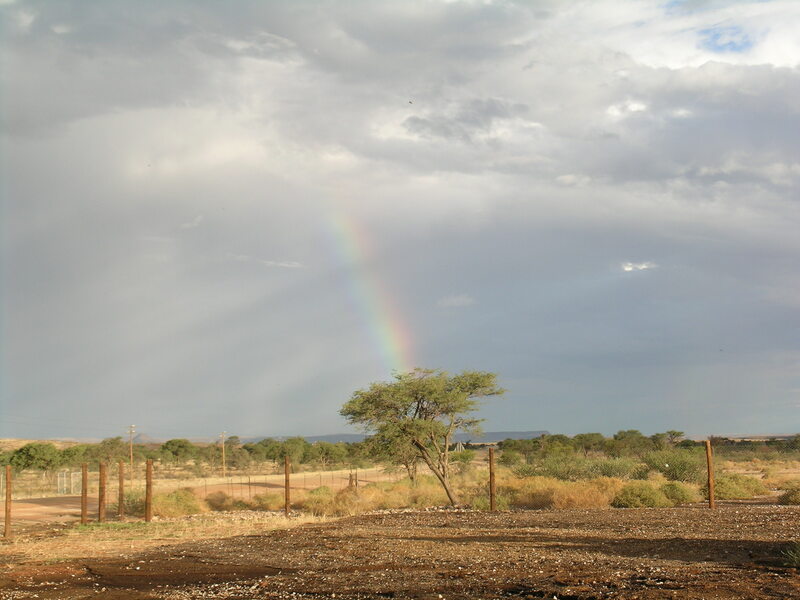 On the border with Namibia and RSA in the middle of winter it rained often during the night, but as we headed north it got dryer and the diurnal temperature range widened to below freezing point at night with dazzlingly bright sunshine during the day. 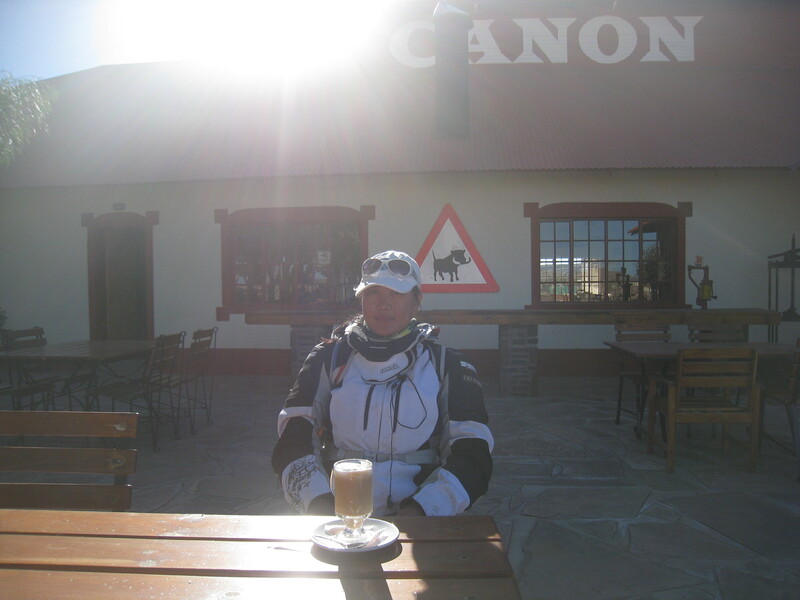 Surprisingly, it was still very chilly riding on the bikes, even in the brilliant sunshine of the desert, and so we were heavily layered up with fleeces and thermals under our riding gear. I was using my old riding gear made by Lookwell and Fanny had some pretty good, but cheap Canadian brand enduro clothes she found online in China. 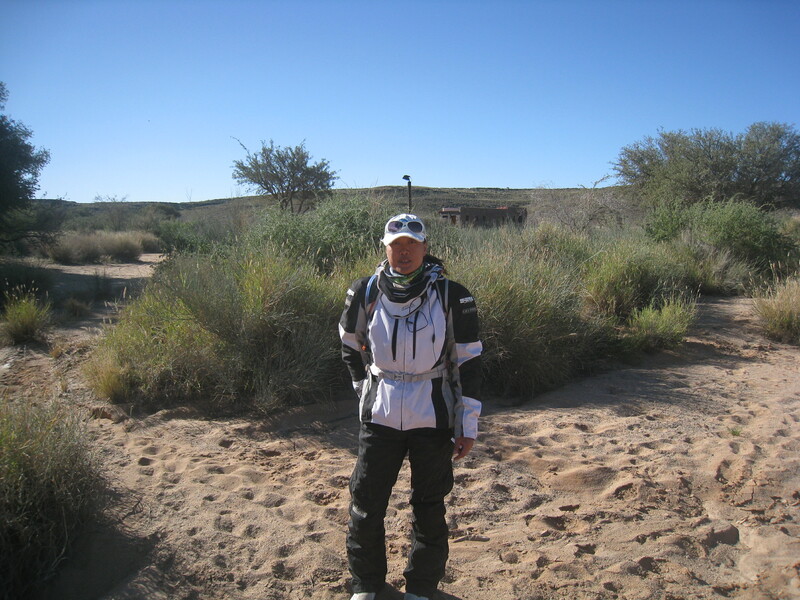 Although my kit looked the part, it was not very good, being neither warm nor water proof and so I often had to pile on layers of clothes underneath. When it rained, which wasnˊt actually that often in Africa, I got soaked through… as we both did in some heavy rains in the highlands of Ethiopia. Later when we got to Italy we were given by a Chinese sponsor outstanding adventure motorcycling jackets, trousers and base layers made by Revˊit. (See Kit & Equipment Page). This kept us perfectly dry and warm and was extremely comfortable… and with built in body armour kept us safe and well protected too. On the second day we woke up early, but faffed about packing and re-packing kit into the panniers and kit bags and strapping things down in intermittent rain. 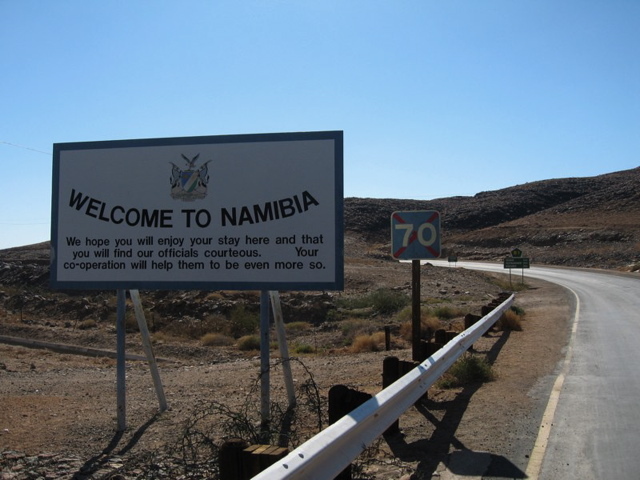 The South Africa/Namibia border crossing was fairly smooth and non eventful as we filled in forms at exit and entry immigration stations. We were both excited now as the adventure was truly underway. No turning back now until Shanghai. 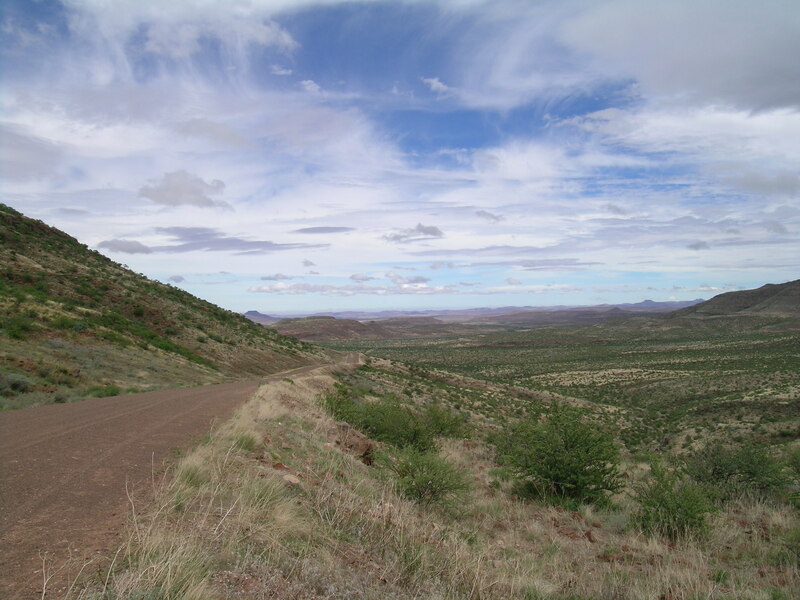 Our target today was not a very long way away, but we would be riding on gravel and sand and so I set our GPS for Ais Ais in Fish River Canyon. 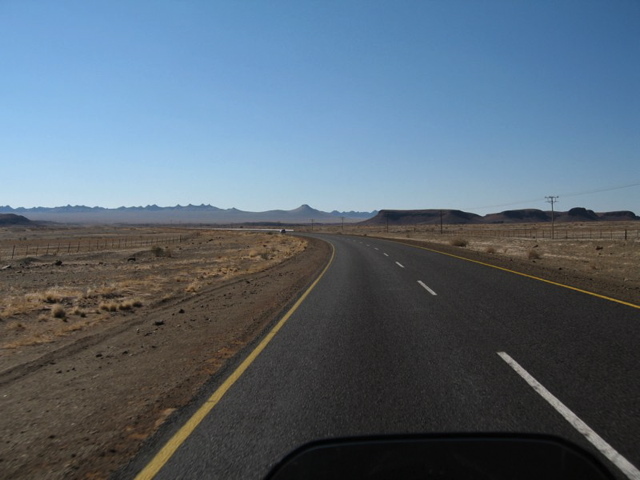 After crossing the border it wasn’t long before we turned off the smooth tarmac road that leads to Windhoek and onto the usual Namibian road surface… gravel. 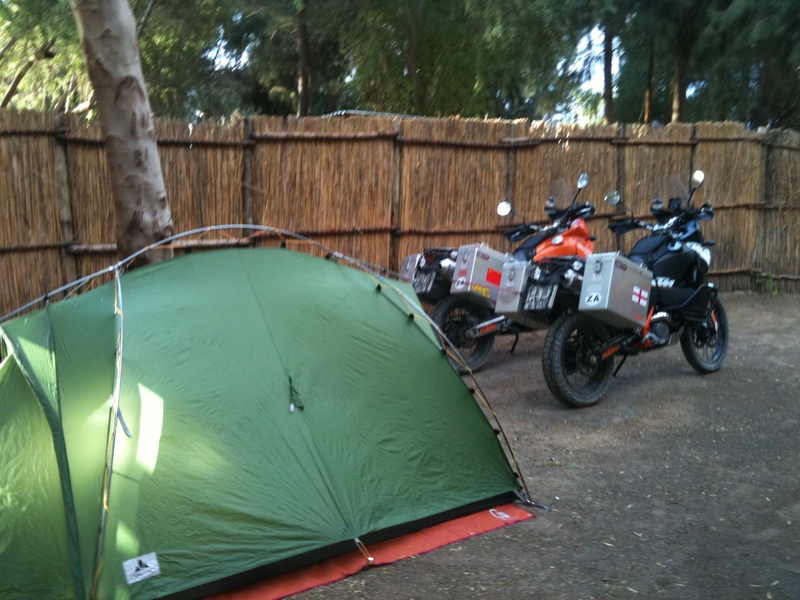 Our standard camping configuration with the bikes being used to secure the guy lines which double up as washing lines. Boots upside down on the mirrors which protect them from the rain and “sort of” prevents scorpions and spiders crawling inside. No animal with a nose would dare venture into mine anyway. We are really in the adventure now… everyday we get further and further away from where we started. I have Fanny and everything I need with me and so home is where we pitch our tent each evening. No mobile phones, no internet… life is the here and now. Its very liberating. 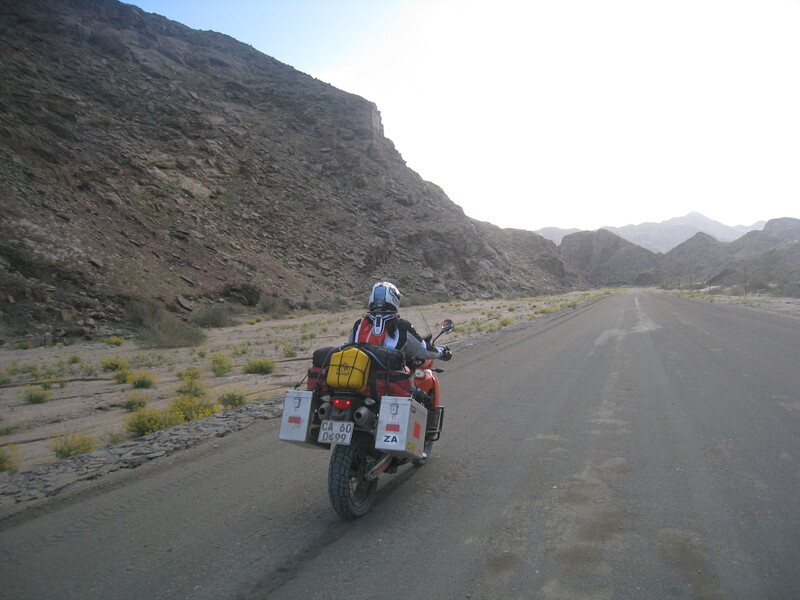 Fanny, with very little experience under her belt is guided along by her KTM. She is still a little unsure of everything but by being on the bike most of the day and every day she quickly settled into the riding routine and started notching up the biking hours. 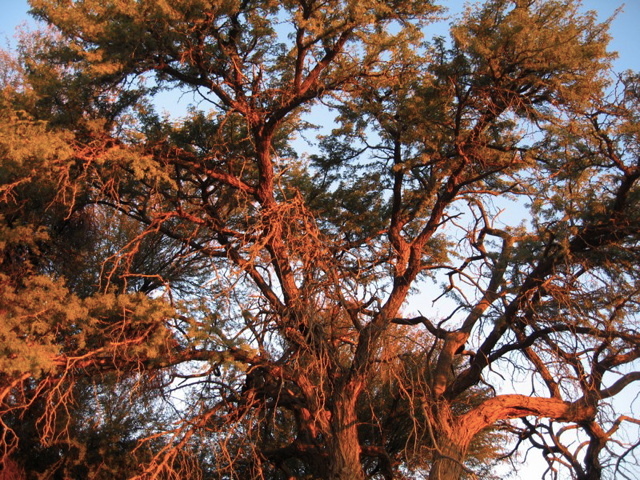 Namibia is very wild, but there are little oasis here and there to relax and re-fuel. 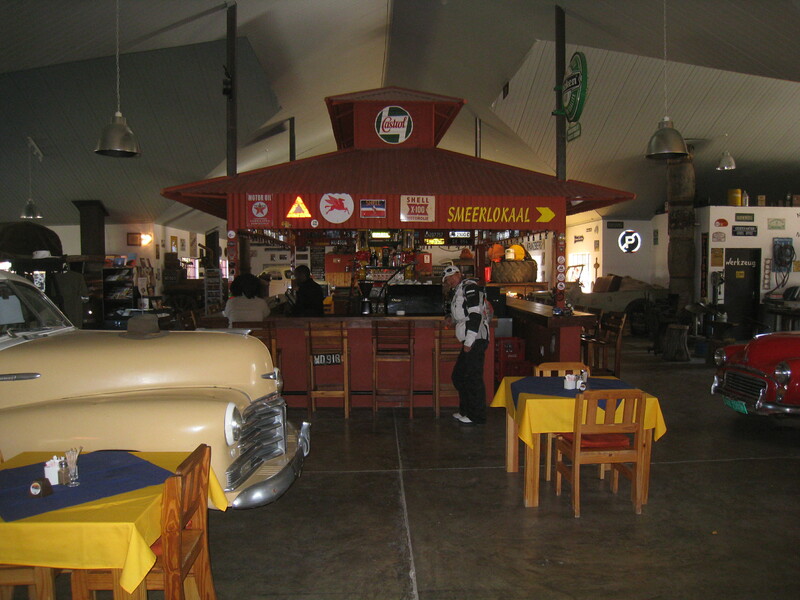 This is the famous Canon Roadhouse that I have visited five times in my life and is now a motor museum in the middle of now-where. Solitaire, for instance, a little further north , has a great cafe which serves up some of the best and most welcome apple pie in the world. 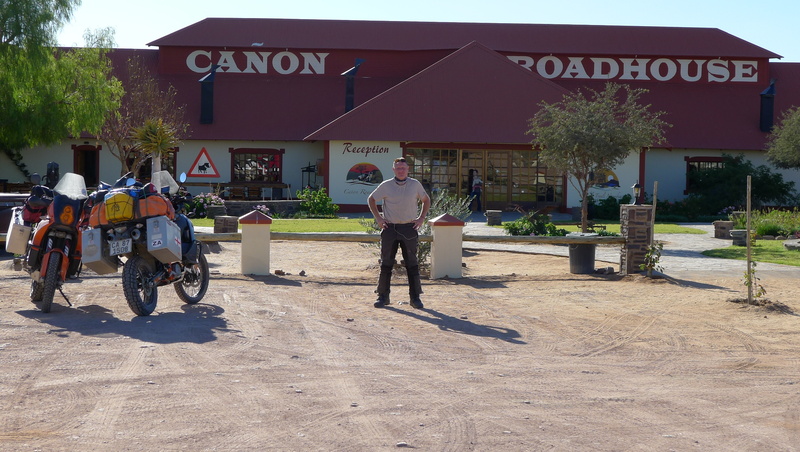 Canon Roadhouse.. a very welcome break. Fanny was doing OK, although she often fell behind and her inexperience started to nag at me and I had the first inklings of doubt as to whether she would manage the expedition or not. She had already dropped the bike several times and remained unable to master U-turns and slow turns on hills which are quite technical maneuvers and not easy on heavy laden bikes when your feet barely touch the ground. Fanny continued to struggle and her confidence was waning with my increasing impatience and overt anger each time she dropped the bike, leaving behind scratches and minor damage to a hitherto pristine condition motorcycle. In fairness, I have fine tuned my riding skills over more than 30 years. Fanny has less than 5 months experience and was now committed to riding a KTM 990 Adventure around the world and so my impatience with her not being able to do this (yet) was unwarranted and unfair. In fact one had to admire her courage and determinism. She is a very tough girl, a real ambassador for China and a champion for women. I think this picture is one of the iconic images of the trip. You cannot imagine how happy and proud I am to see Fanny in full flight in the Namib desert on the best adventure bike in the world. She is an athlete, a former professional one no less, and that means not only physical strength, but mental toughness and a disciplined mind. Experience? It will come. 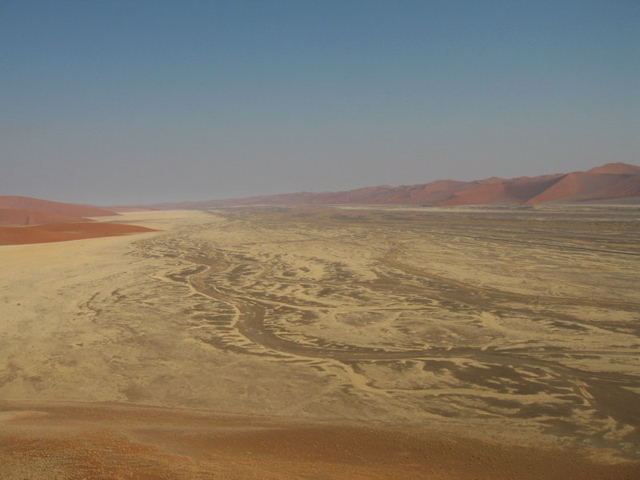 You have to see Namibia to appreciate it… the scale and isolation is like nothing else. 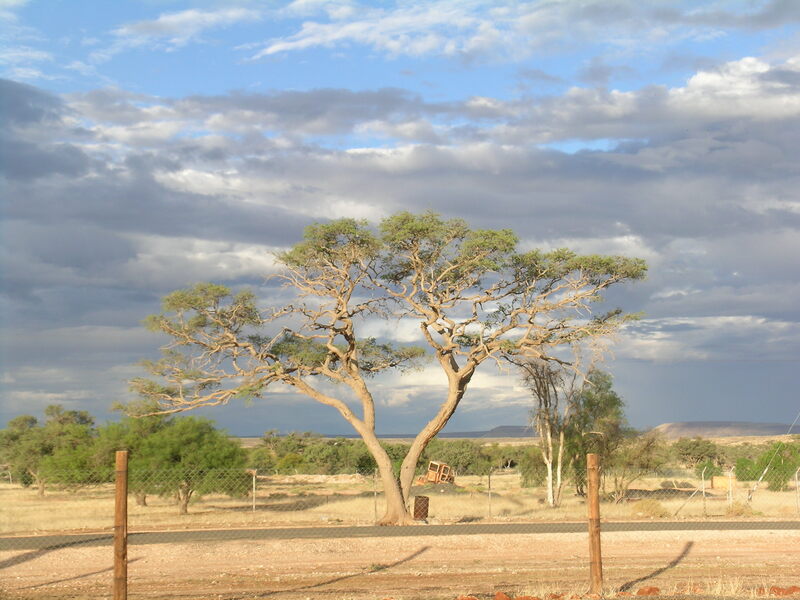 Despite the arid desert it is home to an abundance of fauna and flora. 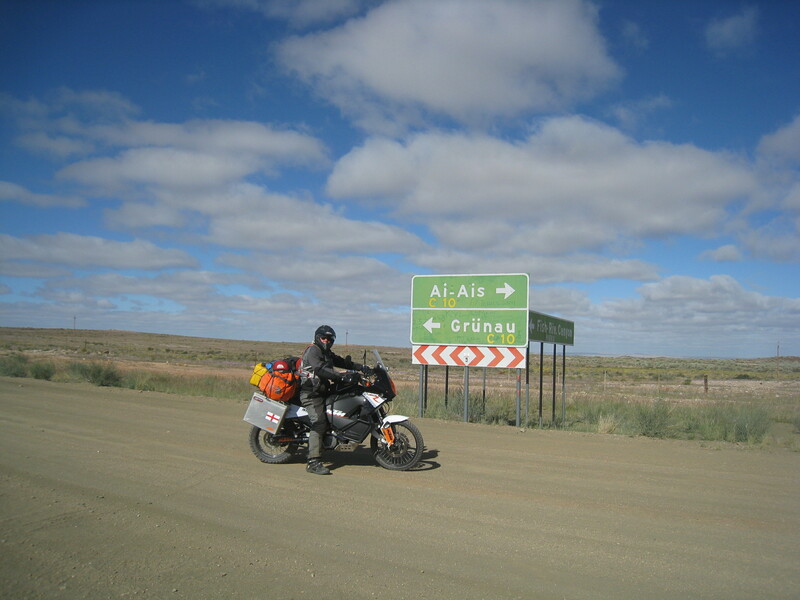 The road to Ai Ais was familiar territory for me as I have been along this awesome route on several occasions. 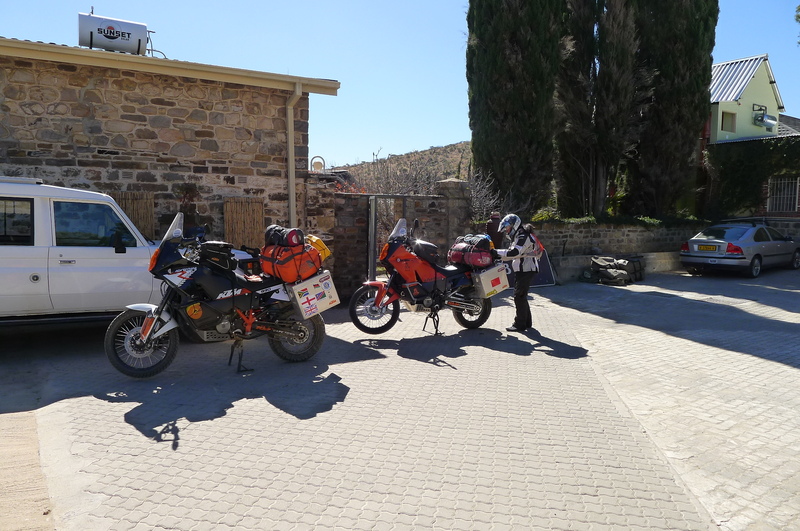 My new KTM 990 Adventure R was handling very well and Fanny was getting better and better on her orange 990 Adventure, handling the windy descent along a very gravelly road into the valley with relative ease. We set up camp along the banks of Fish River in the canyon and took advantage of a restaurant at the camp site and have an early dinner. 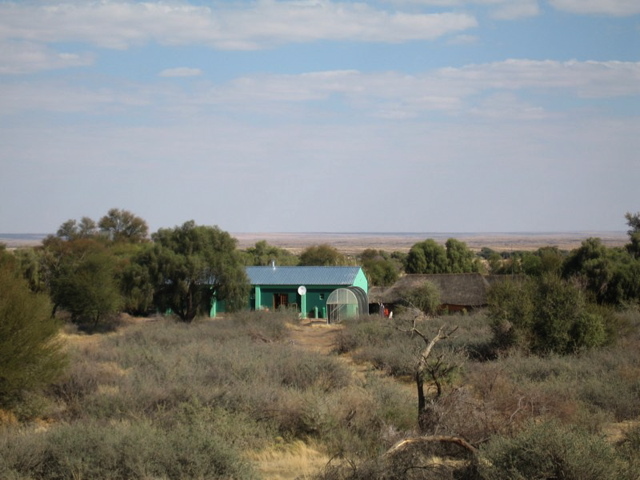 The food served at this overly expensive camp site consisted of standard Southern African stodge and was bland and faintly lacking in nutrition. I think I now know why the butts in this region (both black and white) are excessively large…generous and regular portions of lard and sugar, perhaps? There is actually very good food to be had in southern Africa, but my advise to anyone visiting Ai Ais is bring your own, cook it yourself and then wallow in the hot spring pools. 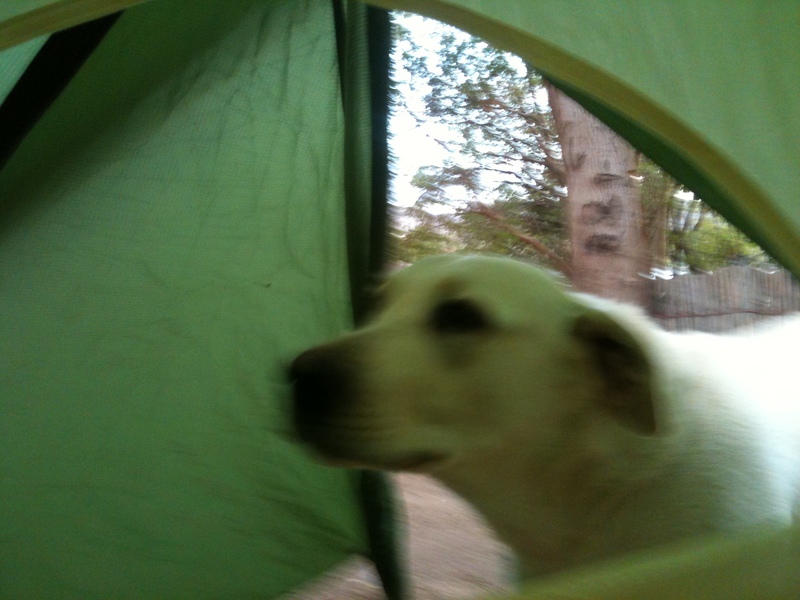 Our tent was set up in the configuration we often used when camped up with the tent guy lines being replaced by the bungee cords anchored to our bikes, clothes pegs on lines and boots in anti scorpion & anti spider position upside down on our bike mirrors. We had another very cold night and our water bottles froze in our tent as the temperature plummeted to below -7 degrees. Only when the sun light streamed down into the valley above the sheer cliffs of the canyon did the temperature rise slightly above freezing. I had not had a chance to do any running for a while and my broken ribs were still aching every time I breathed which did not help my gloomy mood. I had given up my career and spent a huge amount of money for this trip and so I should have been enjoying myself, and I was a bit, but this particular morning I was not. I was cold, my body ached, and was increasingly nervous for Fanny. 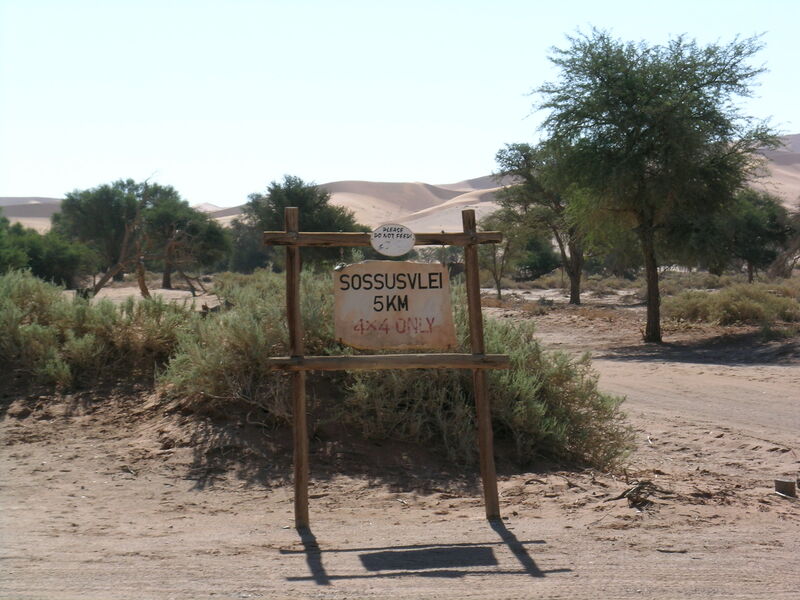 We packed up and continued riding and camping across Namibia and headed towards the highest sand dunes in the world at Soussesvlei. 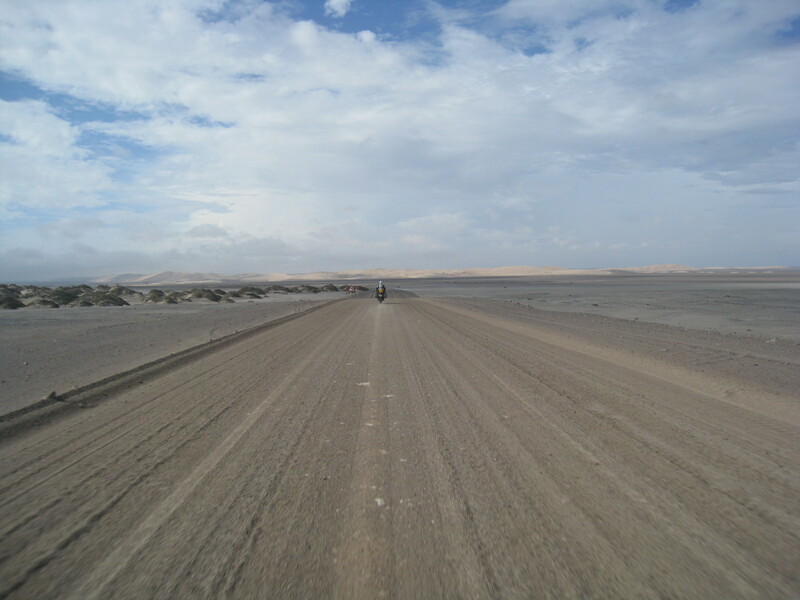 To get there, as Nick Dobson can testify, we had to cross dreaded SAND, but I settled into my Dakar fantasy, employing the skills I recently learnt with “Country Trax Off Road Riding Academy” in South Africa and breezed across whatever presented itself with relative ease… and with improving mood. All was going well. 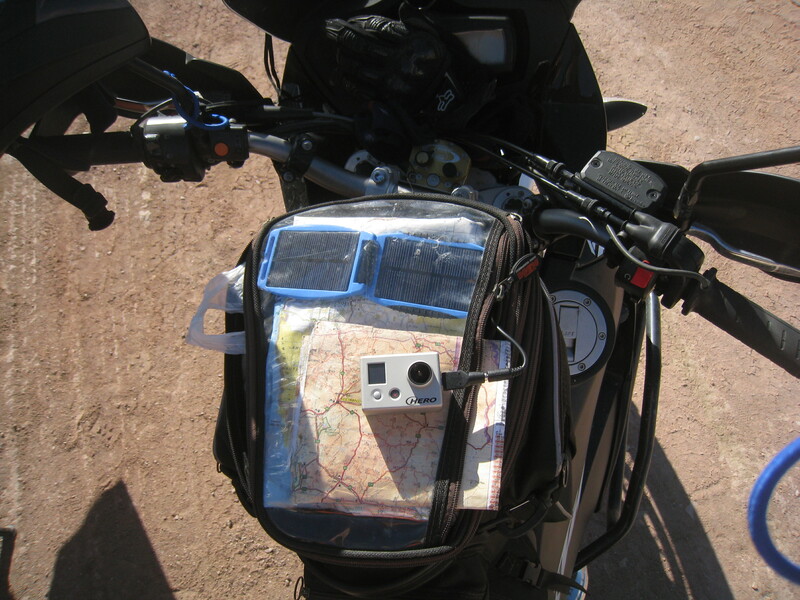 My tank bag with maps, GoPro (later stolen in Egypt) and Power Monkey solar charger. GPS on dash. Is it a road or is it a desert? Its both. Yeeeehaaaa. A coffee latte or an orange fanta? It’ll be one or the other for Fanny. 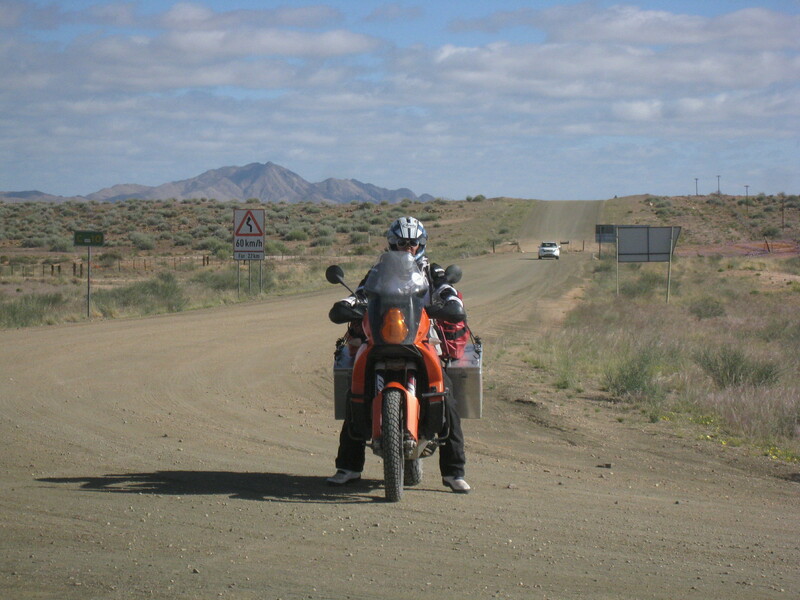 When riding off road the standard and recommended riding position is to be standing on the foot-pegs, thus lowering the motorcycle’s centre of gravity and absorbing the slides, bumps and shakes. I focused on where I wanted to go and battled against the natural instinct to look at where I didn’t want to go. Head up, knees and elbows out and smile is the mantra of off road riding. In much the same way as landing a paraglider, if you look at something you will get target fixation and inevitably fly or ride into what you are trying not to, and so it is a test of confidence to always look ahead. On a motorcycle that means you always look up and never look down, otherwise “down” is where you will end up, inevitably with painful consequences. Riding on the pegs is very exhilarating and both Fanny and I enjoyed it very much. It also gives the numb bum a rest and exercises the legs and stomach. However, you cannot see in you mirrors which are usually set to the normal sitting position and so in order to check mirrors I had to squat down and crane my neck to check behind me. On one of these infrequent mirror glances I was suddenly flushed with alarm to find that Fanny’s orange light was no longer behind me. Except for the plume of dust from my tyres it was completely deserted, no sign of her at all. TA MA DE! My heart pumped and I was filled with a sudden panic and dread. I quickly slid my bike around in a rather dramatic style and rode back the way I came and saw Fanny kneeing down by the side of the road and her bike literally upside down with a trail of luggage strewn across the sand track. Fortunately, Fanny looked OK (ish) and insisted she was fine. She explained that she rode off the road and into the sloping kitty litter sandy gravel and lost control. ‘I was looking at the pony’, ‘and then suddenly I was off the road and came off’. ‘WHAT?’ I ranted, ‘I told you about the camber of the road many times’. I was stressed and worried about her rather than angry, but I had probably not done much for her confidence by berating her. Her bike looked OK, but one of the panniers was no longer a rectangle shape, but rather a sort or squashed shape, the name of which escaped me, but I remembered from mathematics problems at school that the shape definitely has a smaller volume than a rectangle… AND the buckle fasteners were missing. Lost somewhere in the sand. Fanny looked forlorn and in retrospect must have been in shock. We righted the bike, detached everything, considered what equipment I had (or not) and I started a futile attempt to straighten the panniers with a rock. After about 15 minutes a South African registered “bakkie” pulled up with a family group aboard and asked if everything was OK. It was not, I was pretty grumpy and my mind was saying ‘GO AWAY… AND LEAVE ME ALONE’, but perhaps as I reach my half century I am mellowing and instead said, ‘Had a bit of a spill, you don’t happen to have a hammer do you’? 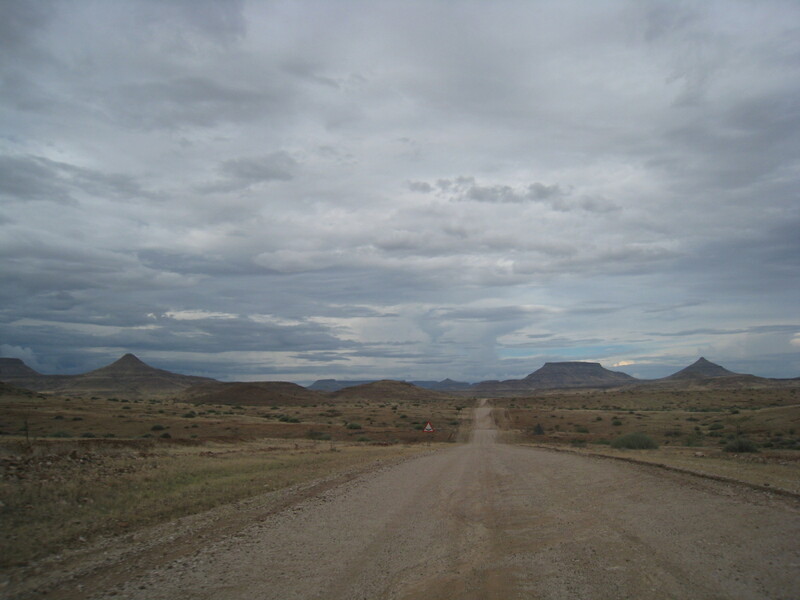 A lot of roads in Namibia are like this. A minute later I was furiously panel beating in the midday sun with a semi circle of South African children being introduced to various Anglo Saxon and occasionally Mandarin expletives…. much to the distress of their parents who quickly decided I should keep the hammer and hand it back to them at Sussousvlei (or whenever). They then disappeared off as fast as they could in a cloud of dust and Fanny and I were left in the middle of the desert. It took me about an hour to hammer the aluminium panniers back into a shape that was as 99% close to how it should be. I would get better and faster at panel beating later on in the expedition as I would get much more experience doing it than I bargained for. I successfully fixed the indicators which had broken off and smashed using gaffer tape (duct tape – a motorcycling adventurer’s “must have”) and created new lens covers with some transparent and curved cellophane packaging from the GoPro camera. 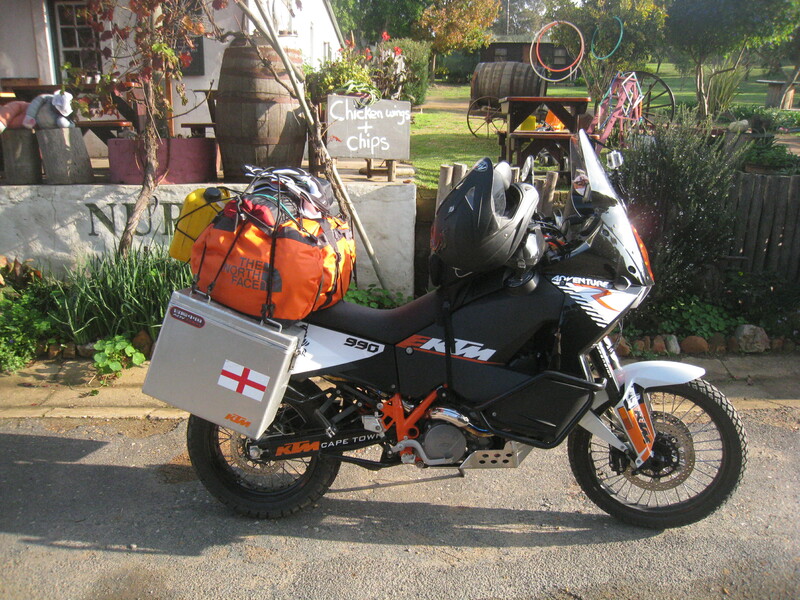 Later I would buy some new indicators from KTM in Windhoek, but we kept the repaired indicators on the bike pretty much until we got to Europe where I knew the police would quibble over my master pieces of ingenuity. We then continued on, but just outside Helmingshausen, or Hell’s Kitchen as Nick Dobson and I had aptly called it two years previously, we had yet another drama. Again, I could not see Fanny in my rear view mirror and so like the last time I swung my bike around and dashed back full of panic and worry. Because of standing up high on the pegs I could not see out of the mirrors all the time and when I did I would usually see the orange glow of Fanny’s headlight just behind me. This time there was nothing again. Heck! As I rode furiously back I could see in the distance that Fanny and her bike had parted company. As I got nearer I was alarmed to see her lying by the road, bike upside down again, but on this occasion she was not looking that good. Now my panic had been replaced with concern and intense worry. I knelt beside her and checked her out and discovered that she had injured her stomach, arms and legs. Her helmet had a huge gash in it and it was clear that the neck brace she always wore had undoubtedly prevented serious injury. She had had a big one. Fanny later told me she came off at about 90 kph whilst trying to keep up with me and somersaulted off the bike into the roadside. I anxiously eyed the rocks and trees nearby that she miraculously avoided and visibly winced as I pondered over what could so nearly have been a very serious crash. 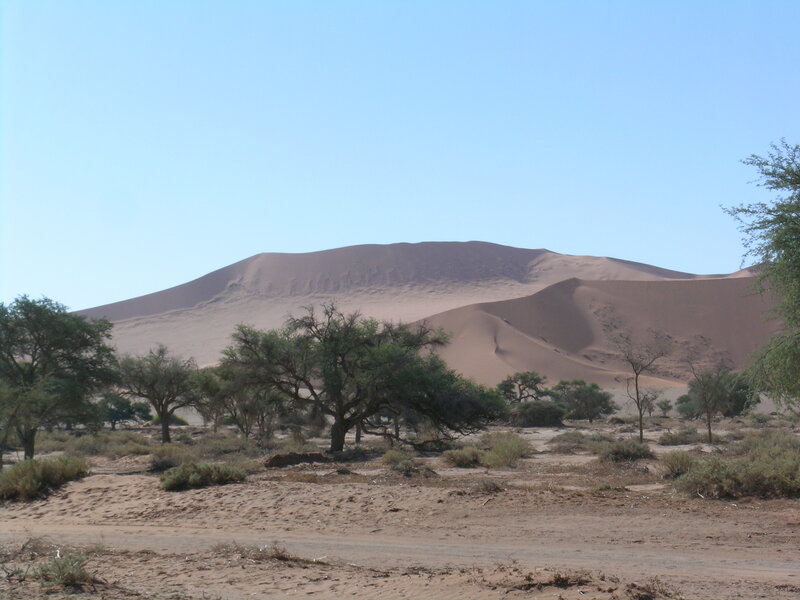 I surveyed the crash scene and using my basic accident investigation skills picked out the tyre and skid marks which had veered off from the gravel track onto very steep sand ridges and then meandered and weaved aggressively into the desert. 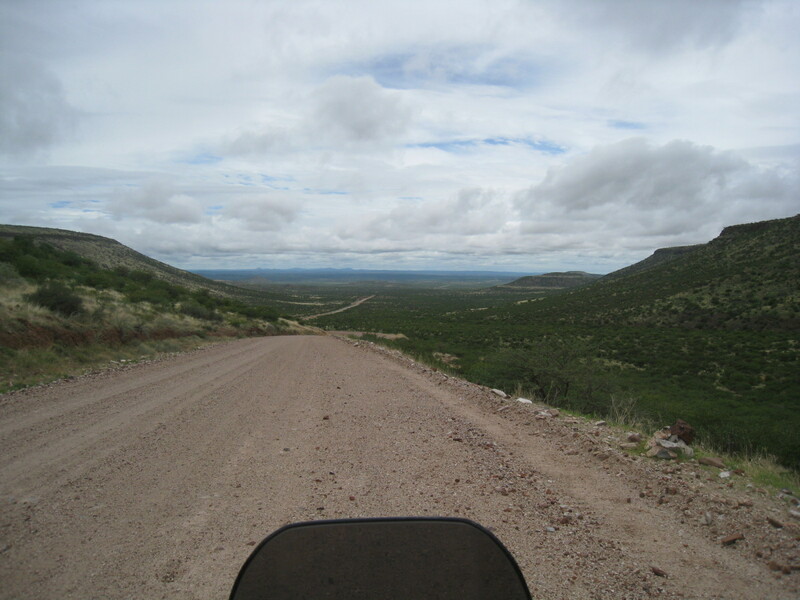 Fanny had ridden onto one of these sand ridges, gone into an uncontrollable wobble and was catapulted over the handle bars into the road side. The bike had also somersaulted over several times and it was very lucky it never hit her. This accident was my fault. I had been riding too fast, in my own little world and enjoying the technical handling of the KTM in amazing scenery and had sort of forgotten about Fanny trying to keep up. Not good. Also, I could see that her motorcycle appeared to be quite badly damaged, at least cosmetically. A mirror had broken off and damaged the brake fluid reservoir it was attached to and the remaining indicators had smashed off and the new touring windscreen had come off, and although intact, was completely scratched and grazed and I was not sure if I could put it back on. 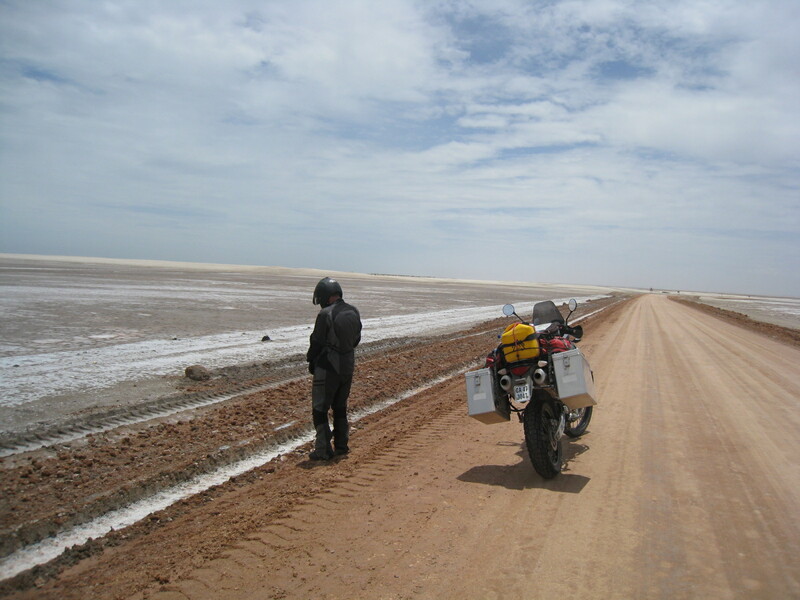 Both fuel and water were leaking from somewhere and the bike was generally looking very sorry for itself… but not as much as Fanny who was in shock and was fearing the trip was over, after only 5 days, and worried she had let me down. My fears for Fanny were compounded when she unusually asked to stop and rest for a while. She is the toughest woman I have ever met and not one for drama and theatrics. If she says she is hurt then she is really hurt and probably quite badly. Having been trained in first aid on numerous occasions during my police career and having a very well stocked first aid kit I was able to do what was needed at the scene. But we were in the middle of the desert and Fanny needed to rest. After fifteen minutes or so I asked Fanny is she was able to limp the bike back to Hell’s Kitchen. Unfortunately, Fanny cannot ride my bike. The suspension of my KTM 990 Adventure R is much longer than on her standard bike and as such Fanny cannot put her feet down on my R version. 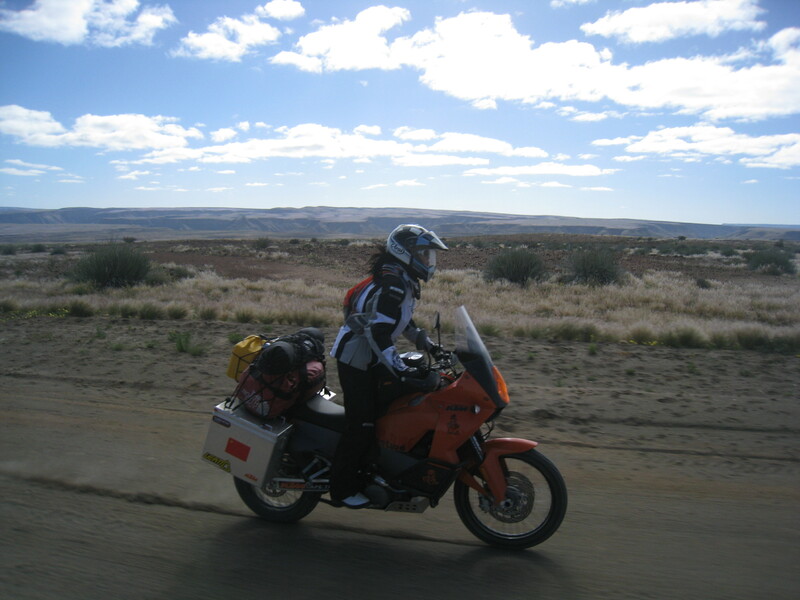 Also, Africa, like many other places, is not the place to leave a motorcycle unattended, if you would ever like to see it and its contents again, and so she was insistent to ride her own bike. 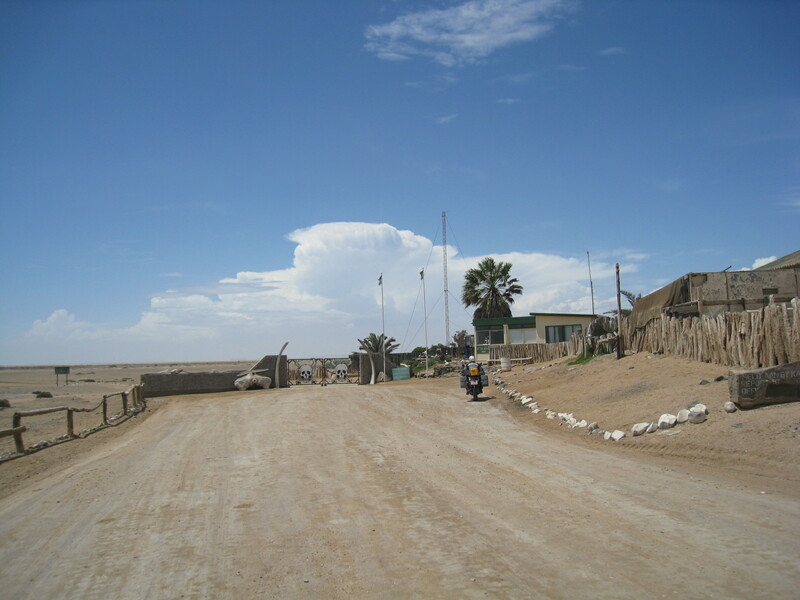 We definitely couldn’t stay where we were, the next town was 180 kilometers away on quite bad roads, and so we had to get back to the nearest habitable place we had ridden through. We had no choice. In true Fanny determined style she did so and we hobbled 20 kilometers back to the nearest village, set up camp and continued the first aid on Fanny’s wounds. A day or so later livid bruises appeared all over Fanny’s body and she had a deep cut to her lower stomach. If she had been a man I think the handle bars she flew over might have removed some important appendages. Fanny being a woman was clearly a little more streamlined in this particular area. My eyes were watering thinking about it. Back at camp and with Fanny patched up and rested I started on the repairs which required “bike band-aids” ( i.e. gaffer tape) on nearly everything, removing remaining extremities and stripping everything down to the bare chassis to examine the damage. What concerned me was that the front forks seemed out of line. Had I more experience I would have realized that they had just slipped in the triple clamp. As it was I was not entirely sure what remedial repairs could be made or indeed how to do them. I did my best and then we made use of a local restaurant and sat by the fire in the chilly evening air and contemplated the options ahead. 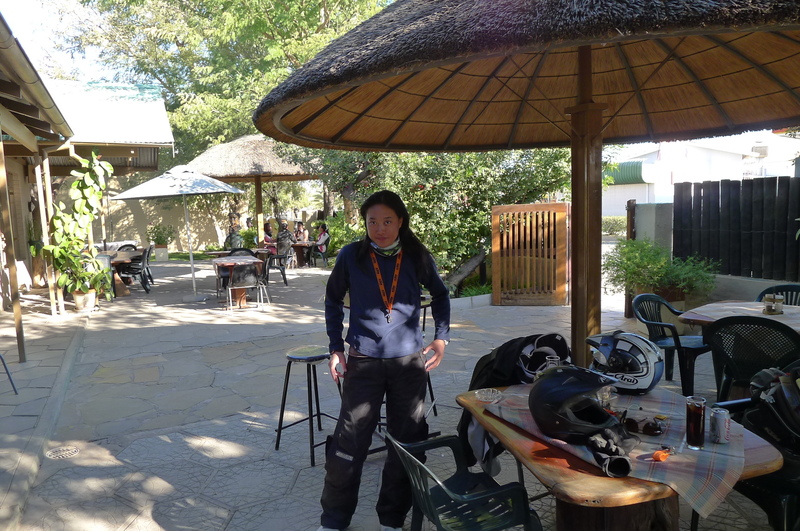 The next day we both felt slightly better, more positive and made a plan to try and get the bike to a KTM garage I knew existed in the Capitol city, Windhoek. We would stick to the best roads possible as Fanny’s steering was about 15 degrees out… which meant riding with one arm stretched out and the other bent as if turning a corner. 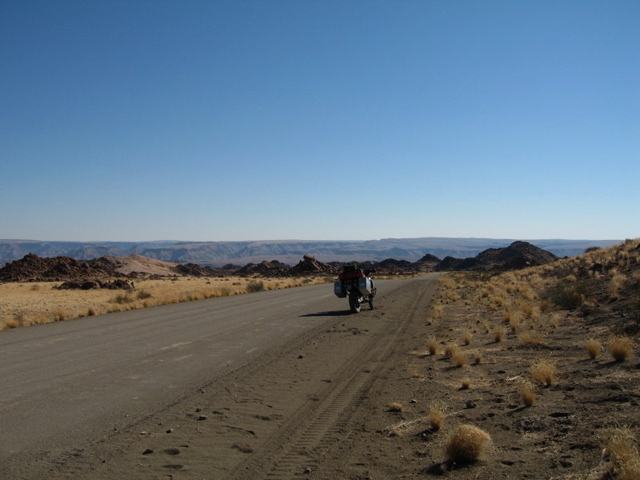 Not a great way to ride a 1000cc adventure motorcycle across a desert in Namibia, but Fanny managed with ease and we made steady progress to a highway town called Kalkrand, reaching it just as the sun was going down. Kalkrand is not really on the tourist itinerary and so it was difficult to find anywhere to eat and sleep. I asked at the police station and they said we could camp in their compound and use the court room (adjacent to the police station) for light and electricity. Our mood had lightened somewhat and we had a fun night chatting with the police officers and making a video of a night courtroom drama in which we all larked about and played roles of judge, defense attorney, defendant and police prosecutor. The things you can do when there is no computer, internet or idiot box (TV). In our mock trial with the local police, I was convicted and escorted off to the jailhouse which looked like it was from a scene in the movie “Saw”. 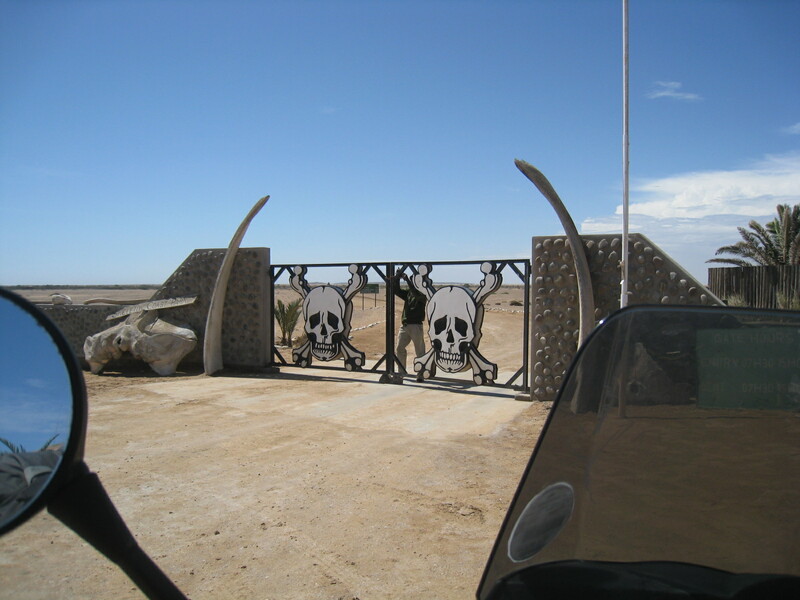 Note for file – In real life don’t get locked up in Namibia. The cells would make the Turkish prison in the 1980’s movie “Midnight Express” look like the Ritz. The karzie was particularly bad too… but I have seen worse…. I do live in China after all! 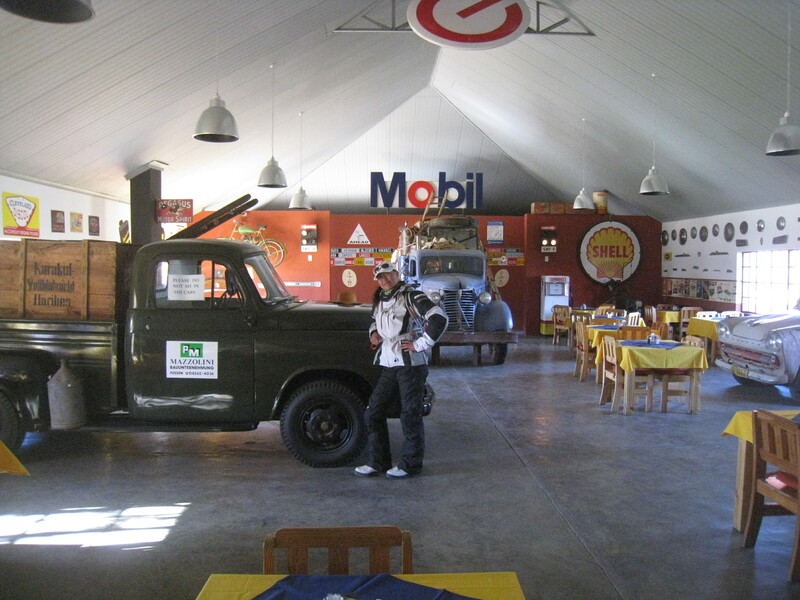 Kalkrand is basically just a fuel station and a popular rest stop for truck drivers between South Africa and other parts of Africa, and so naturally it also attracted the local “ladies” of the night who ply their trade. On a visit to the local petrol station to buy some provisions we saw that one truck driver was having a full blown party in his cab, music blaring, dancing and singing. 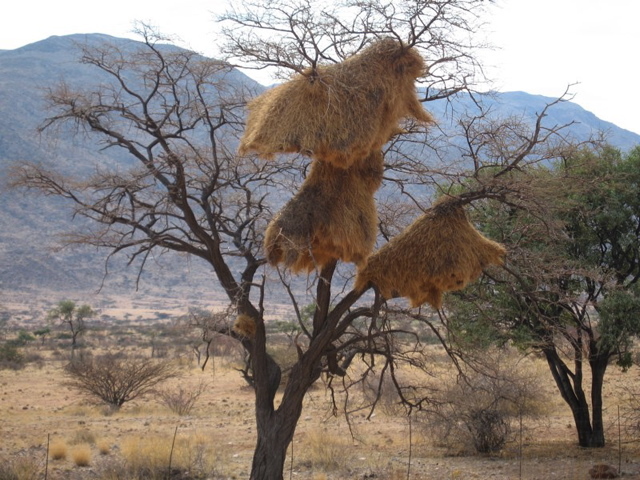 Looked like they were having a good time, but what we were actually witnessing was one of the various ways that the deadly “ÄIDS” is spread across southern Africa and why its so rampant in these parts. 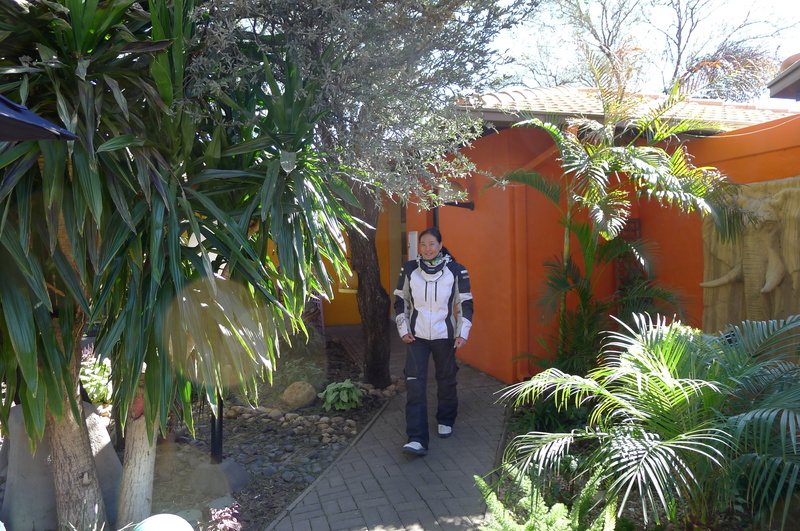 The next day we continued along the main highway into Windhoek and searched around for a place to stay. 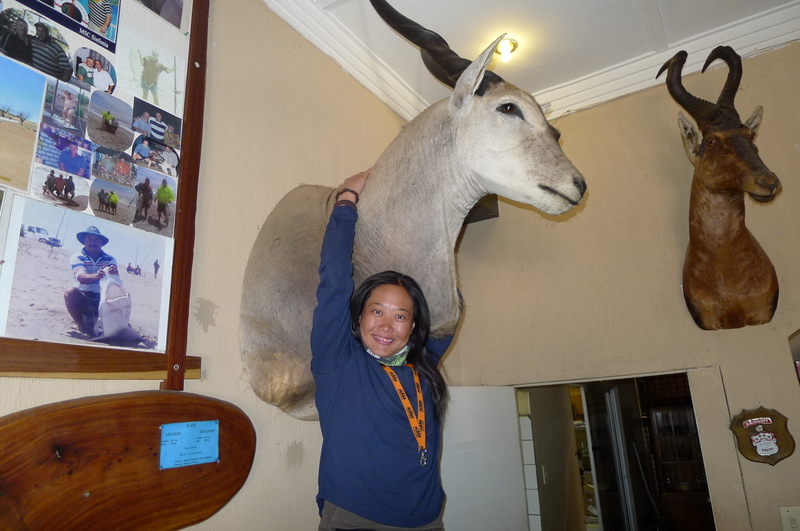 I decided that we should fork out and stay in a lodge so that Fanny can relax and recover and after a police like sweep of various roads leading in and out of the city we found a decent enough, albeit above our budget place to stay. 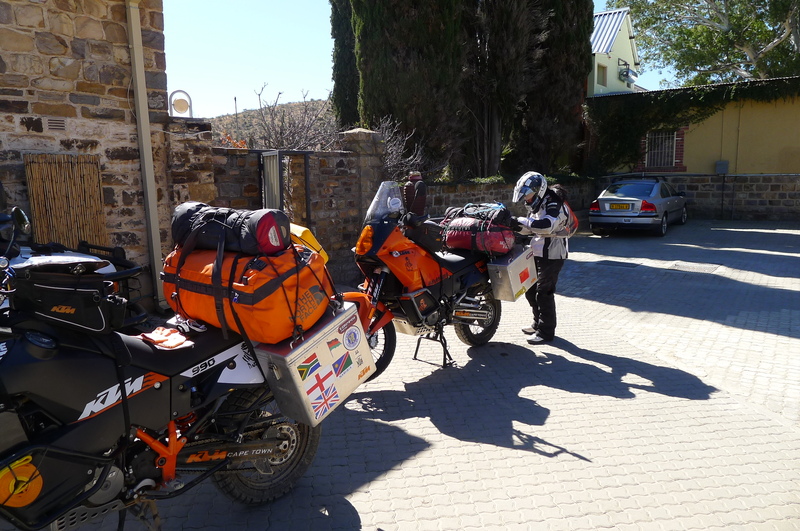 I also tracked down the local KTM garage and handed Fanny’s bike into the very capable hands of Kevin who runs the Windhoek operations and no doubt has seen many broken KTMs as Namibia is a very popular destination for off road and enduro motorcycling. 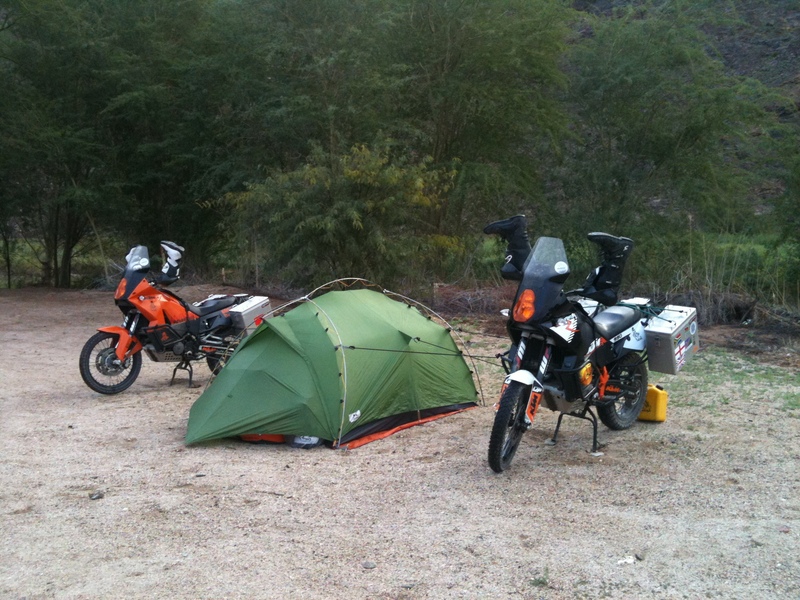 In fact many off road expeditions are run from Windhoek using various types of KTM enduro and Rallye motorcycles. 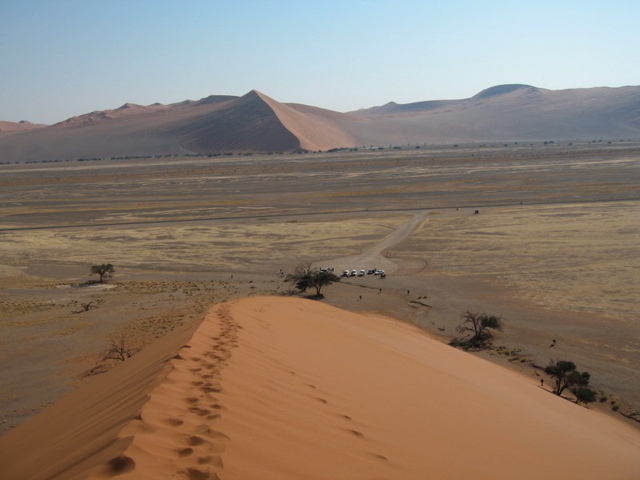 Namibia is the sort of Morocco and Tunisia of the southern hemisphere and there are some truly spectacular and amazing rides to go on. Poor Fanny… all part of her education at the school of hard knocks. BMW has done a better marketing campaign with the likes of the Long Way Down/Round guys championing their brand, but I think the Austrians at KTM actually have the better range of bikes for adventure riding on all terrains. Better chassis, better balance, a much more off road adventure orientated bike. 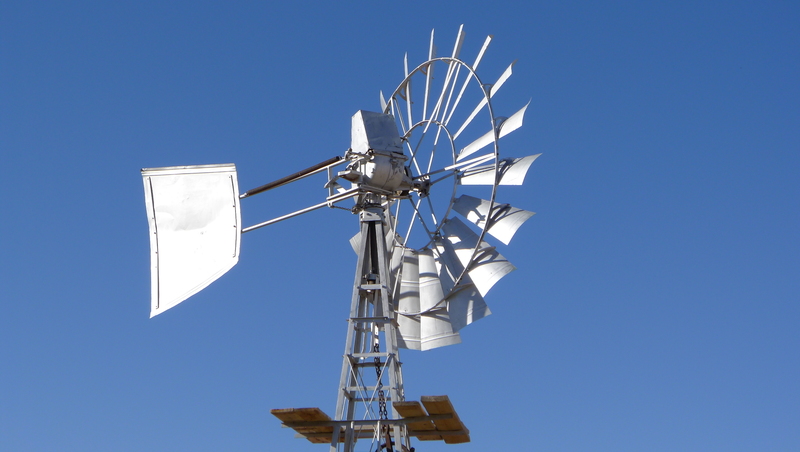 The only negatives I have about our KTMs are describe later on in Chapter 7, but these are minor and most things like poor water pumps and clutch slaves have been upgraded and improved upon in later models. Too right….I can’t say how relieved I felt… and it was a great birthday present, although the crashing repair job nagged at my mind somewhat. There again, I suppose so long as you keep the crashes to an even number on each side you will point straight! On the 29th June I turned 48 and we had a very relaxing day in Windhoek doing touristy things and later had dinner at a Chinese restaurant. I am unapologetic about eating Chinese food in Africa. It’s my favourite food and its my birthday and so shui zhu niu rou, suan la tang, chao qing cai, qie zi and qing dao beer cheered both Fanny and me up and the rest of the time we idled about looking around Windhoek and eating a huge chocolate birthday cake from Mugg & Bean coffee shop in the city centre. Back on the road again… bikes as good as new. Even if Fanny’s isn’t looking as shiny new as it was when we started. But then one could say it now has true gravel track cred. A real adventure bike, not a commuter. 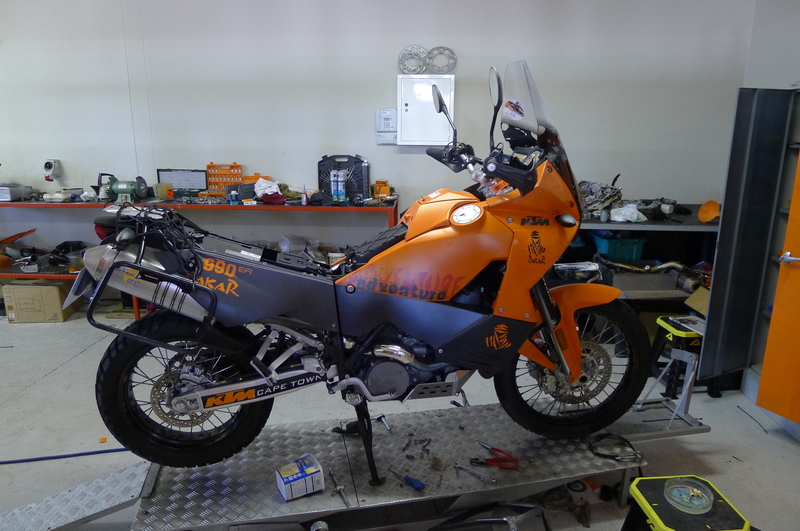 The next day I arrived at the KTM garage and I was a bit alarmed to see a naked KTM on the mechanic’s work bench. Trying to disguise my disappointment I asked Kevin if everything is OK and he explained that both his mechanics were in hospital after being T-boned on their motorcycle at a junction in town by a truck. But, Kevin reassured me, he will personally work on the bike through the evening. I opened my mouth and for once in my life no sound came out and I gulped and thought of something nice to say and appropriately asked, ‘Are they OK?’ when I in fact I was really thinking ‘Thank heavens the bike will get fixed’. So we had another night in Windhoek which is quite a nice city and I think was good for both of us … especially Fanny who had been pushing the limits in these early stages and trying above and beyond. 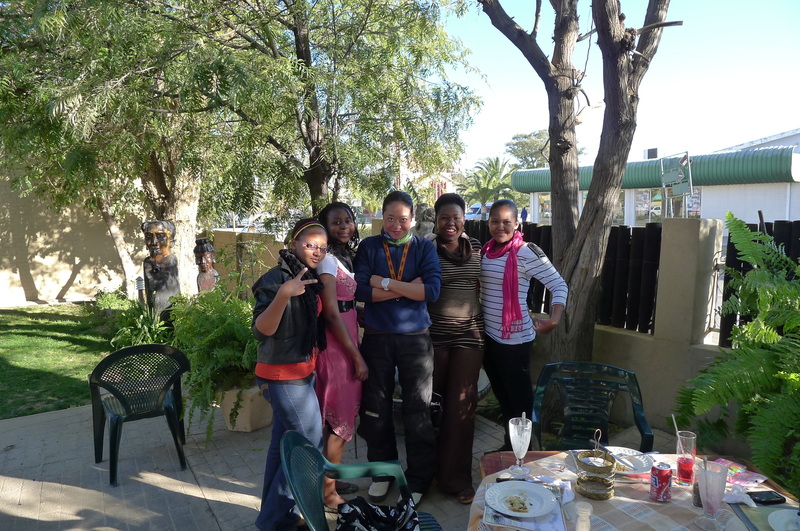 She really needed some down time and I was quite happy to chill for a bit longer in Windhoek. In the morning we were pleased to find that “Stella” had been fixed. It turned out there was nothing really wrong with it. The fluids I saw were of course caused by the bike being upside down as it somersaulted through the air and nothing was damaged or broken. The steering was still, to my eye, a fraction of a degree out when compared with my bike, but Fanny said she couldn’t tell the difference. In any case, I did a few more lamppost adjustments and it seemed just fine. Eventually we had the front forks looked at by KTM in Nairobi and they basically did nothing and seemed to think they were OK. However, much later on at the superb KTM centre in Sharm El Sheihk in Egypt the talented Egyptian mechanics did a thorough service on both bikes and properly re-aligned and re-torqued the triple clamp on Fanny’s bike. Since Fanny had ridden it across the whole of Africa by then it was academic, but we just wanted to make sure the bike was 100%. These KTMs are tough machines and the actual WP front forks themselves were absolutely fine and lived up to their reputation of being the best. Kevin told me that he managed to find new indicators and he had put them on the bike. The brake cylinder had been mended with a new cover, seals and gaskets, fluids re-bled, cooling system and radiator checked, and broken off mirrors re-attached to a more robust KTM handlebar attachment. It looked the part and dare I say like a true adventurer should, unless you are selling one and every scratch is being scrutinized by a potential buyer for his commute into the office each day. 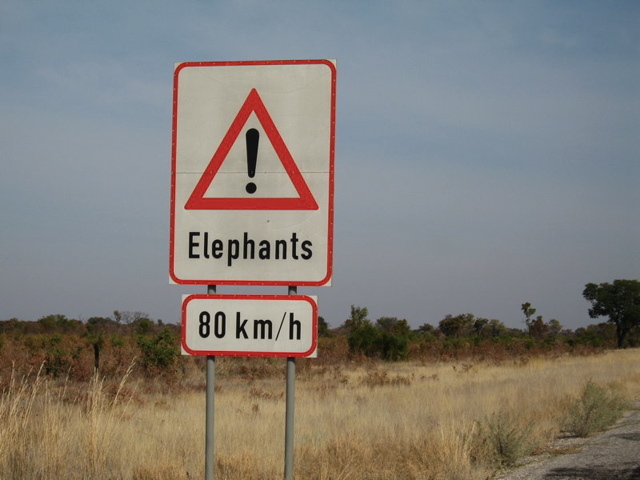 I decided there and then that the new indicators would come off as soon as I got a chance and indeed they did at our next camp on the Botswana border crossing. The old bashed up ones that I mended with the cellophane lenses were put back on. It was a wise move as Fanny would no doubt have a few more indicator jarring incidents before we reached Europe, from where she would really need to start using the indicators… and I suppose more importantly, other road users would actually start taking any notice of them! 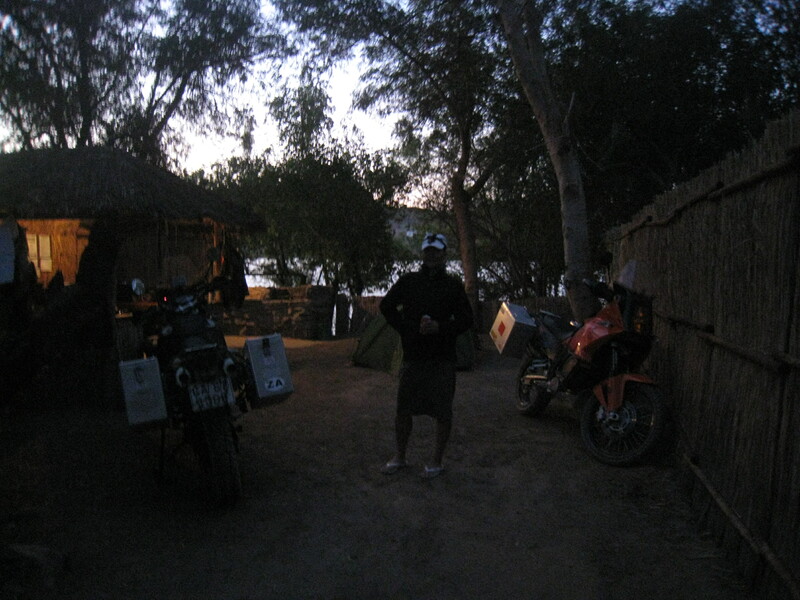 In fact, the old indicators stayed on the bike until we reached Alexandria in Egypt, albeit heavily taped up and increasingly opaque. 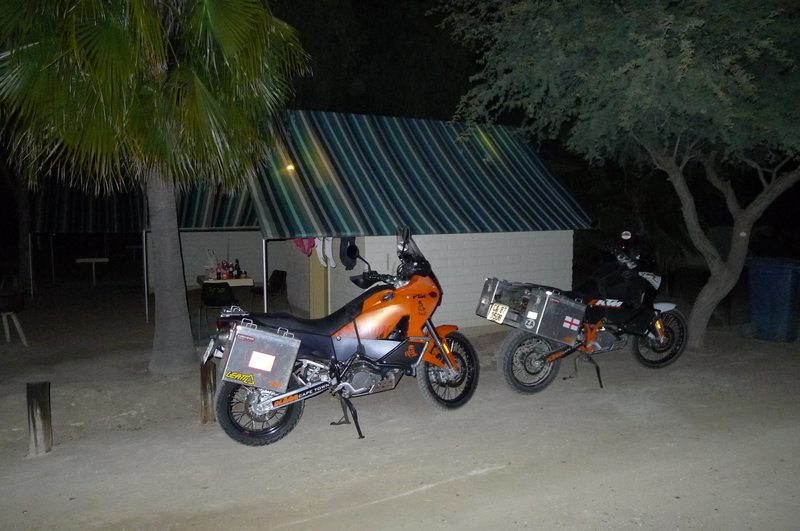 We had a great ride to the border with Botswana along the Trans Kalahari highway and camped in a “deliverance – esque” camp site that was a bit odd. Is that the sound of banjos or the happy clappy Big J squad?. Who knows? A very strange place run by some seriously odd people, but we did manage to rent a cabin for the night, have a good meal and a few glasses of South African wine. All was good. The next day Botswana immigration processed our papers in remarkably quick time. I think because it was 5 minutes to lunch time. Another note for file—arrive at border crossing just before meals for speedy processing. Arrive at borders just after a meal has started and you’ll be hanging about a lot lot longer. We handed over 180 Pula (US$20) for both bikes that included insurance, tax and vehicle clearance. This was quite reasonable and so there was no need to get the carne de passage signed and stamped. My best birthday present was that Fanny was in a great mood, she had recovered from her ordeal and was raring to go again. Later, however, I was a bit annoyed to see her drop the bike again when we pulled off the highway to have a rest. Every single road that leads off a tarmac road is either sand, gravel or steep – mostly all three and Fanny at that time continued to struggle on all these surfaces… especially when trying to U-turn on a slope. This is mainly because the bike is quite big, a bit heavy, and her feet barely touched the ground on slopes. At that time she didn’t have the confidence and subtle throttle control to keep the power on when performing tight turns. In fairness, the KTM’s throttle is a bit snappy and takes a bit of getting used to compared with other bikes. After we got going again I suddenly noticed I did not have my Canon IXUS camera that was normally attached by a bungee cable to my wrist so I can take videos and pictures on the move. This was the very same camera that I have had for years and used on all the expeditions in Africa, China and indeed all around the world. Despite retracing my steps I could not find it. Perhaps a five year old camera is too much of a precious item in Africa for honesty to make an appearance. It was apparent that I dropped it whilst picking up Fanny’s bike at the coffee shop. As annoying as losing the camera is, I lost three days of pictures and many videos taken whilst riding one handed through Namibia and Botswana. Hey ho! Writing this blog (that nobody reads) and trying to upload pictures. Anywhere will do… as the trip went on both of us made less effort to actually bother to hide. Not that there is anywhere to hide in a desert or salt pan in the first place. 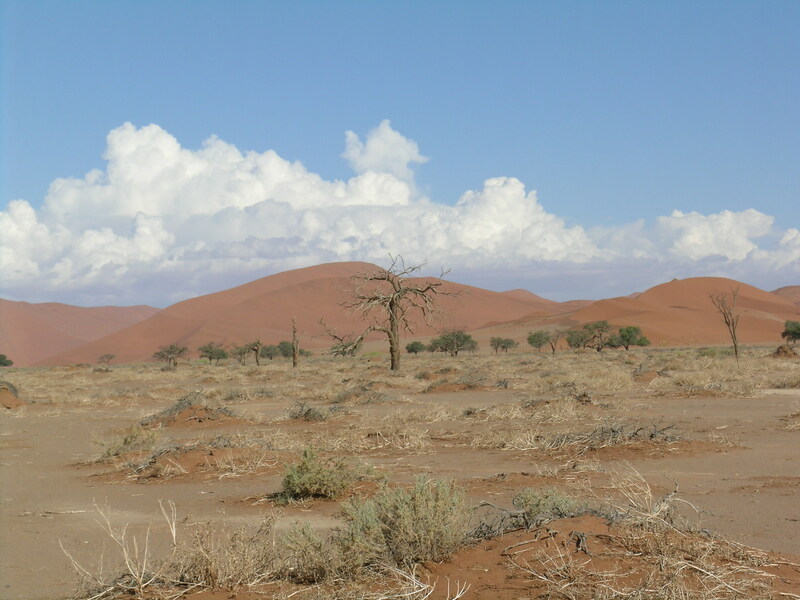 At this time of year it is dry… but in the rainy season the lightening in the desert is terrifying and there is no-where to hide. Ever onwards…and so we continued eastwards and saw the landscape change from brown/yellow/orange desert to classic South African Springbok colours –green and orange. There were more and more animals, although mostly cows, donkeys and goats by the side of the road and a few weasely things that often waited until the last moment and then dashed across the road in front of us. The bird life was truly amazing and will admit I am a secret twitcher and many of the birds I managed to recognize from the wildlife books I keep at my home in Arniston. A very common roadside bird was the yellow horn bill…a bird that is caricatured in “The Lion King”, a Disney animated movie that I have watched a thousand times with Max junior over the years. It really is a fascinating creature with its over sized beak and full of character. Whilst cruising through the bush I also recognized Africa’s largest eagle perched on a roadside telegraph post and so I U-turned and went back to take a picture. Whilst I was snapping the birdie I noticed Fanny also started a U-turn and then, all too predictably, she stalled the bike and dropped it right in the path of an oncoming “land train” truck that was charging towards us. With not a little amount of panic and rapid heart beat we scrambled and picked up her fully laden bike and thereafter had a full and frank exchange of views by the side of the road, mostly concerning throttle control and the physics of inertia involving rotating and suddenly non rotating engines before we headed off again in a huff. After I got going I noticed that my iPod Nano was no longer attached the the end of the earphones inside my helmet. 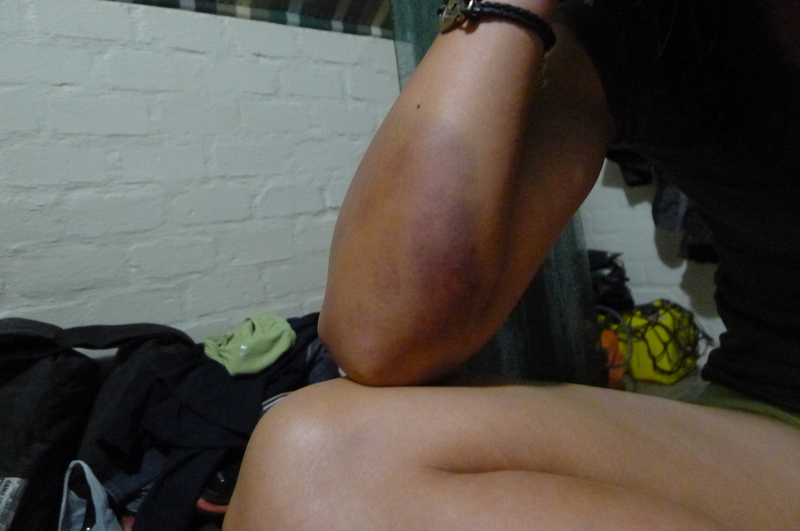 I realized that whilst I was wrestling Fanny’s bike from being ploughed into by a 40 tonne land train I had dropped it. I was so annoyed at myself that I decided to find the iPod Nano come what may. Unfortunately said iPod Nano was one inch square in size and for good measure the same orange colour as everything else around us… from one horizon to the other. After a fruitless twenty minutes searching up and down the road I swallowed my pride and asked Fanny in which of the hundred similar looking telegraph posts along the exact looking road was the African eagle perched upon. Fanny has a photographic memory and immediately pointed at a pole some three hundred meters away. I gave her my “Why the clucking bell didn’t you tell me before? look. 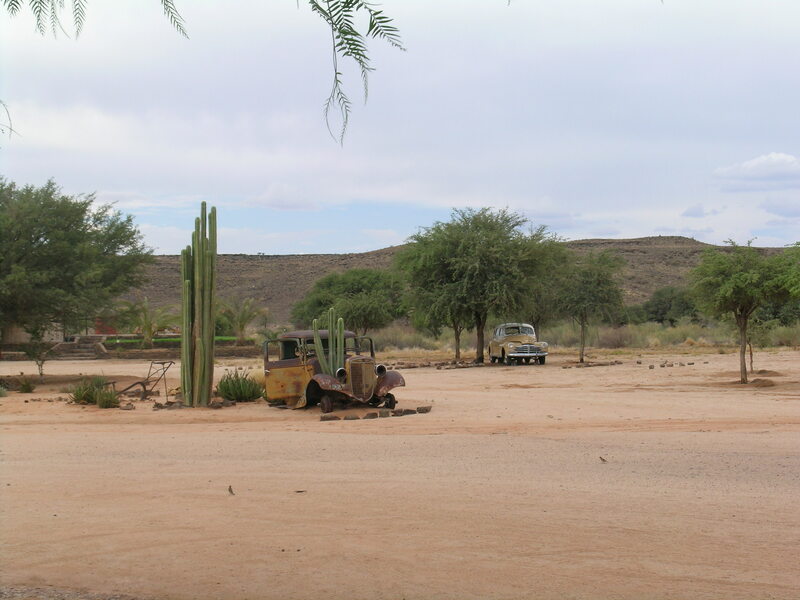 And so I stomped up the road in the middle of no where, muttering to myself ….AND LO AND BEHOLD … right next to the very same telegraph pole and apparently NOT run over by any of the many trucks was the small orange MP3, perfectly camouflaged in its Kalahari desert colours. As I marched back triumphantly to my bike waving the Nano above my head I am certain I heard Fanny call me a ‘lao touzi’ (old fart). Males!?.. we can’t help ourselves. We were riding in the dry season fortunately… two years previously I was in Namibia during the rainy season and the sudden storms and particularly the lightening strikes were terrifying. 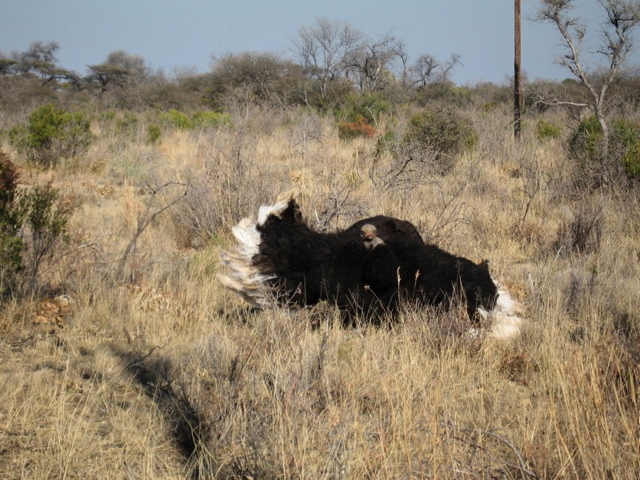 Its not uncommon in Namibia not to see anyone for days. It is perhaps my favourite place to motorcycling in the whole world. This entry was posted in Africa, Elephant, Fanny, KTM, Lion, Rupert, Uncategorized. 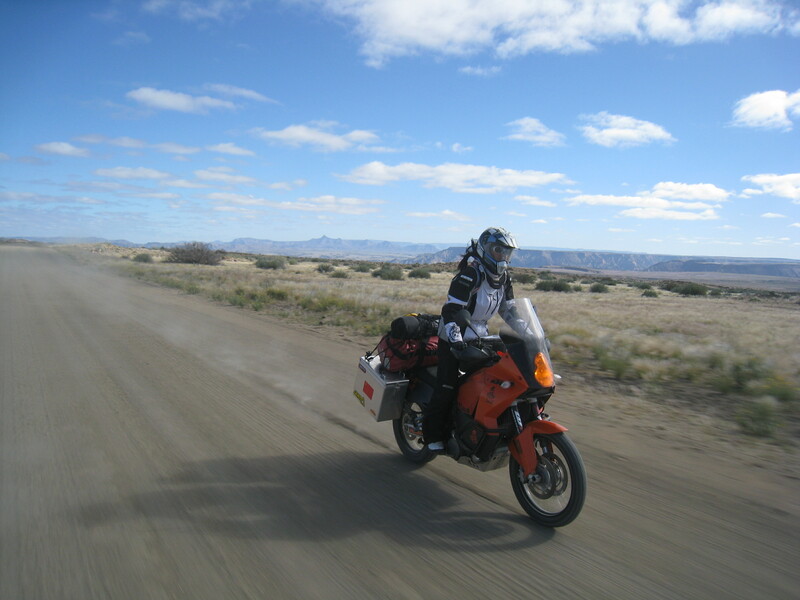 Tagged 990 Adventure, adventure, alpinestar, arai, Big Bike Trip, crash, excitement, Fanny, fun, gravel road, KTM, Namib desert, Rupert, sand, solitaire, South Africa, Springbok, sun, touratech, Windhoek, women riders. This really ought to make a good book. I am enjoying it very much, particularly as you are both strong characters and don’t dress things up. Fanny is my hero too. Just discovered your blog. I will be reading all of it. 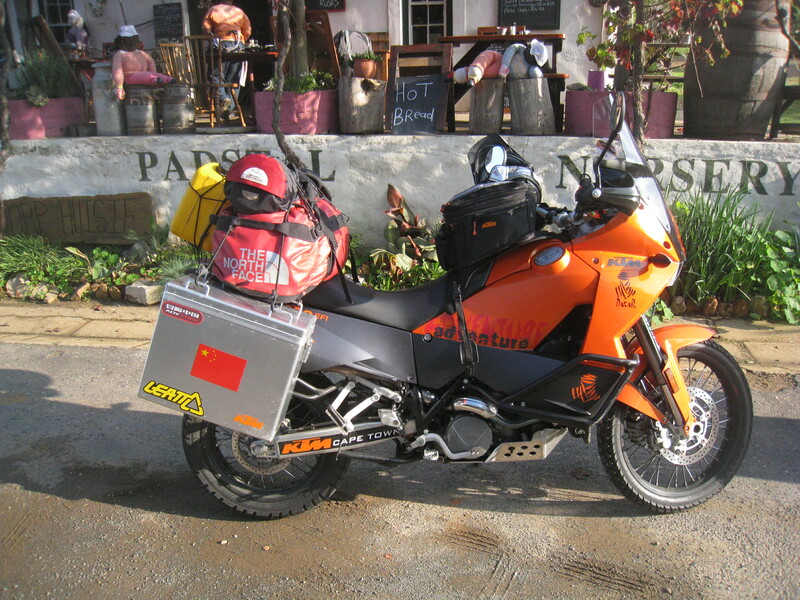 I rode a motorbike in Nigeria, Cameroon, Niger, Benin and Togo over 30 years ago. My trips were no longer than 3 weeks at a time but your account brings back fond memories of them. Hey, Just discovered this Website. Will surely read all of your travelogue. your post is really motivating me to go on a ride. I really loved it. I have just started riding on my pulsar 200NS and trying to discover. The highest I have covered on my bike 1,500 kms from Bangalore to Mumbai at one shot. Hope I meet you some day while I am on a ride. Hi there! We are now planning our Africa-Europe ride and wonder if you could provide your Africa start month… how many months did you ride up Africa together before entering Europe? thanks. We will also go south to north so would appreciate this extra bit of information. Thanks. The weather depends on your route and your pace. It is unlikely you will avoid extreme weather but winter to winter is a good idea given you cross Southern Hemisphere into northern . There are things to avoid, like rainy season and lightening and thing to try and coordinate like great animal migration in Serengeti/Masai Mara. 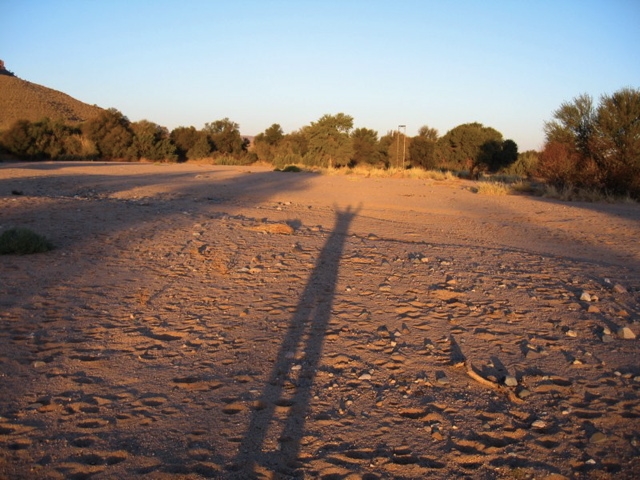 Ethiopia can rain a lot and Sudan and deserts can be very hot. We saw it all from cold in Alps and Himalayas to extreme heat in Sudan. Visas and carne de passages will restrict timings a bit. Plan places to send spare parts like tyres and filters (Nairobi perhaps). Once you get going you will be in swing of things.